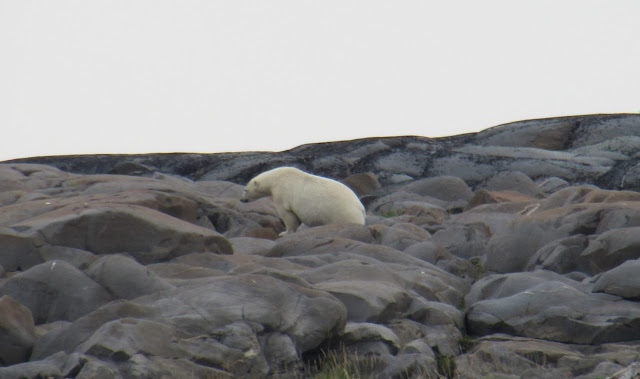 Churchill Manitoba has long been a famous destination for polar bear lovers who like to take advantage of its unique location to get up close and personal with the poster child of the Arctic. But there's another marine mammal, the beluga whale, now competing for the title and once again Churchill finds itself in the unique position of being able to offer an up close and personal encounter with these iconic creatures as well. 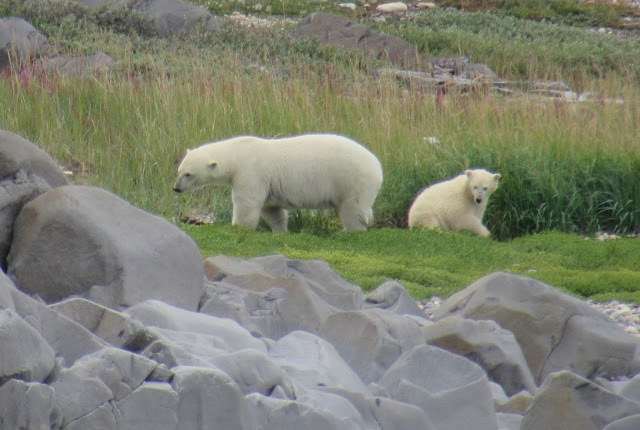 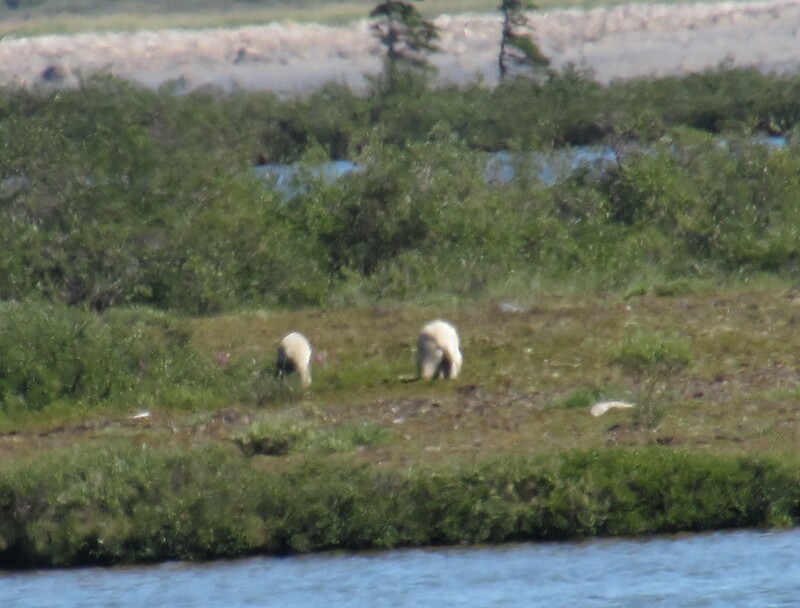 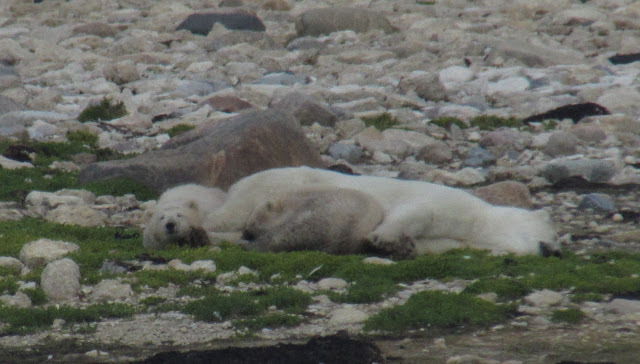 Polar bears, however, mostly come to Churchill in the fall and belugas come in the summer and what we were hoping for was an overlapping period in their respective travel schedules that would give us the chance to see both on the same trip. 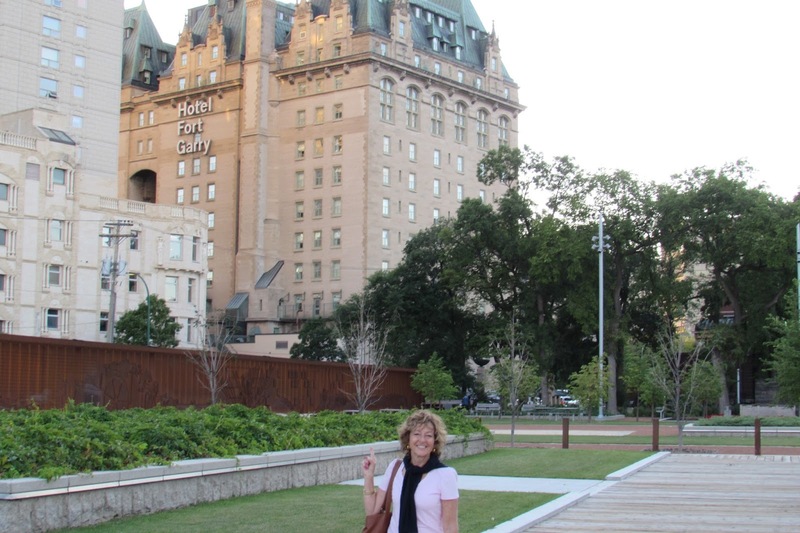 Arriving in Winnipeg our first stop, after checking into the Fort Garry Hotel, was exploring the nearby and newly completed Upper Fort Garry Park which stands on the historic site of the original Hudson's Bay trading post established in 1822 and used as the company's administrative centre until it was seized by Louis Riel in 1869 and became the location of the Provisional Government of Manitoba until 1870 when it joined Canada. 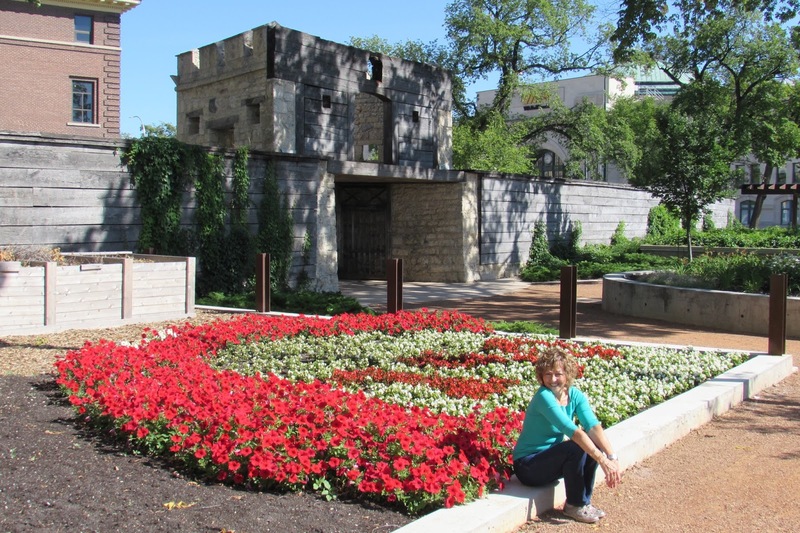 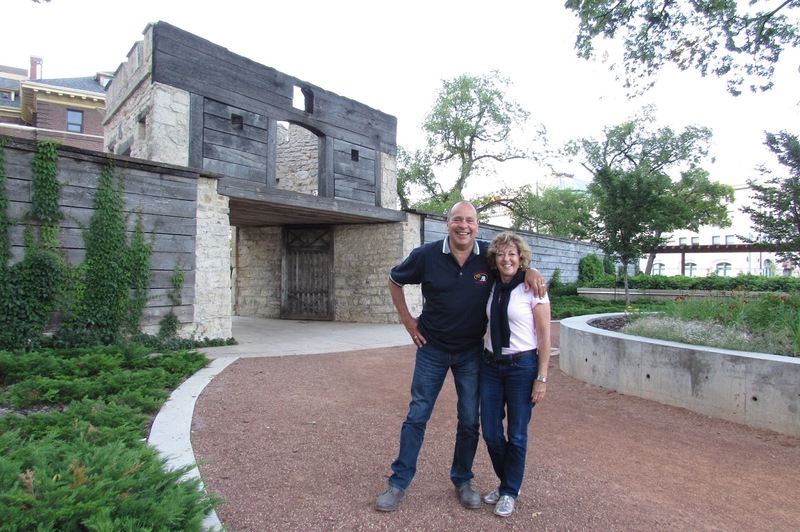 Recently the "Friends of Upper Fort Garry" completed the construction of an historical interpretive park inside the old fort's walls, that includes a sound and light show along a 400 foot steel wall marking the size and location of the original west wall, and traces the history of western Canada and the building of Winnipeg. 2nd stop was The Forks, the historic crossroads for Winnipeg and a confluence of the Assiniboine and Red Rivers where, for 6,000 years, First Nations people met and later European fur traders, Metis buffalo hunters, settlers, and thousands of immigrants who came to set their bearings and decide on next steps. 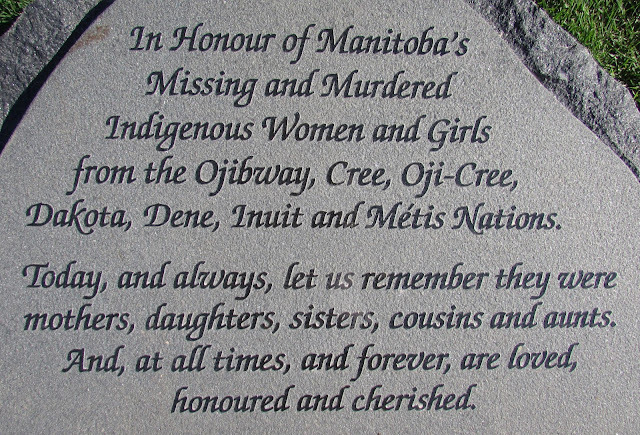 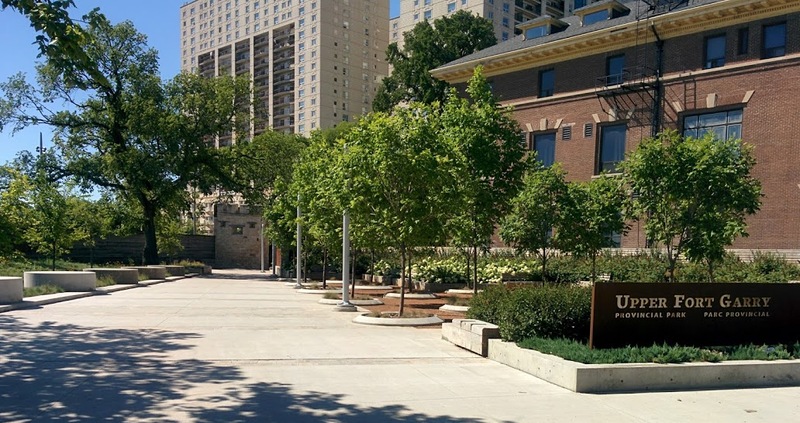 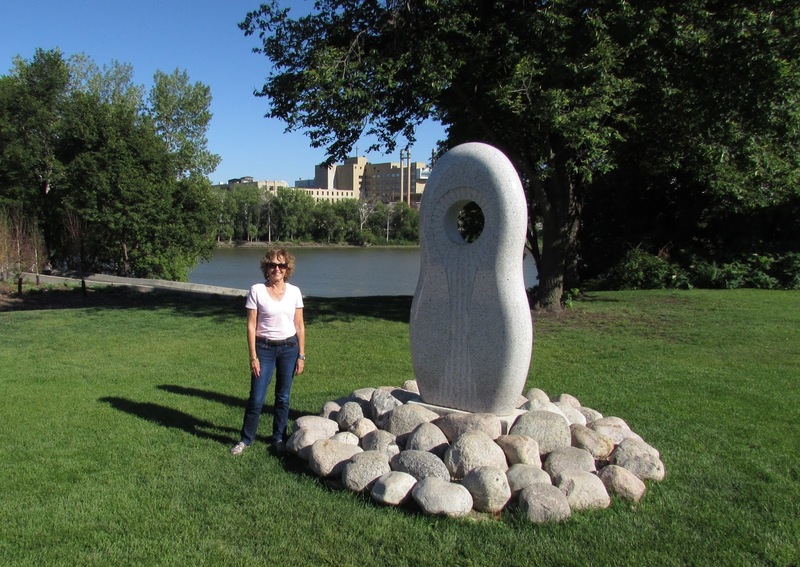 It's also where the monument to all the murdered and missing indigenous women stands in stark contrast to the peaceful beauty of the park itself. 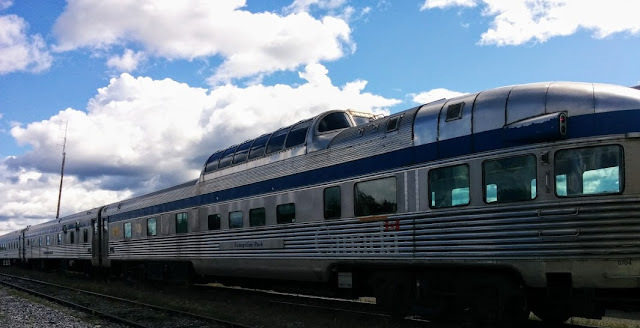 All roads to Churchill start in Winnipeg but in fact there is no road to Churchill, you can either fly from Winnipeg or take a two day train ride with Via Rail. 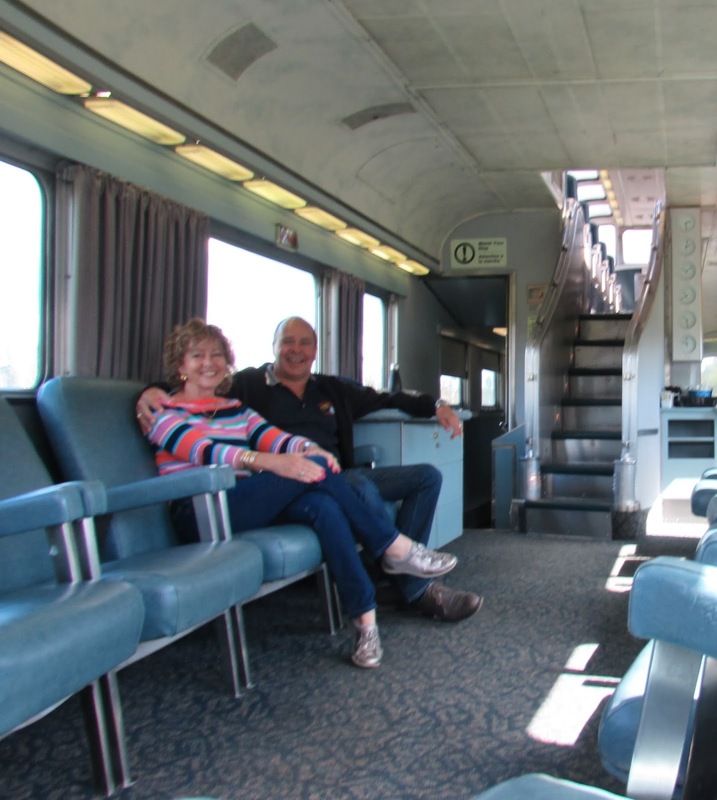 Because we love the laid back and more scenic experience offered by train travel we opted to take the train on the way up and then fly back for the return. 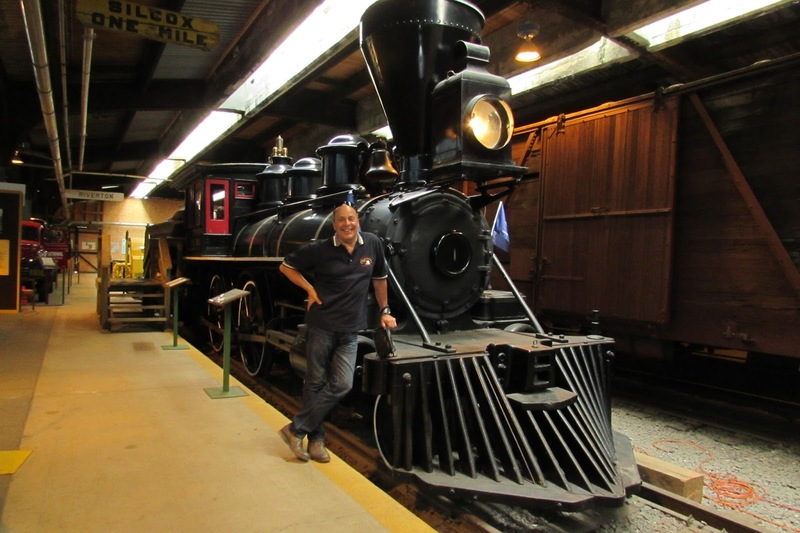 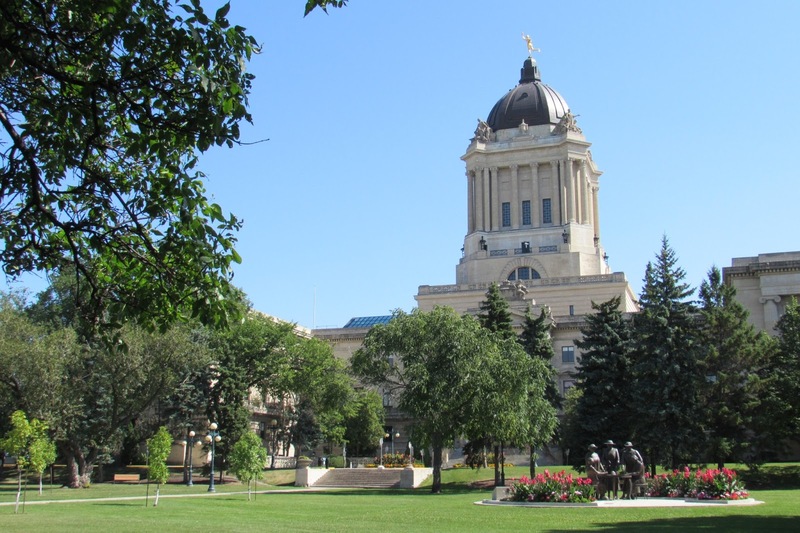 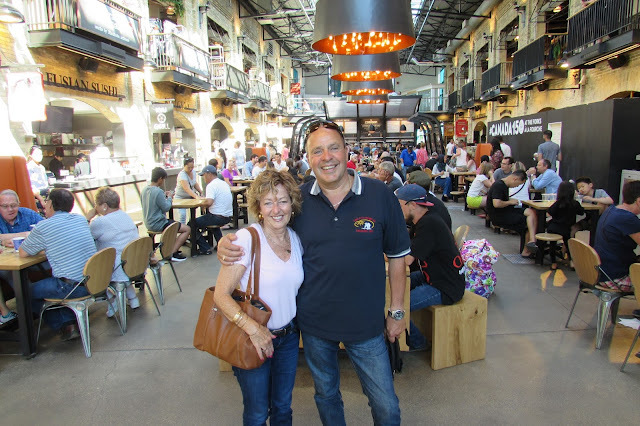 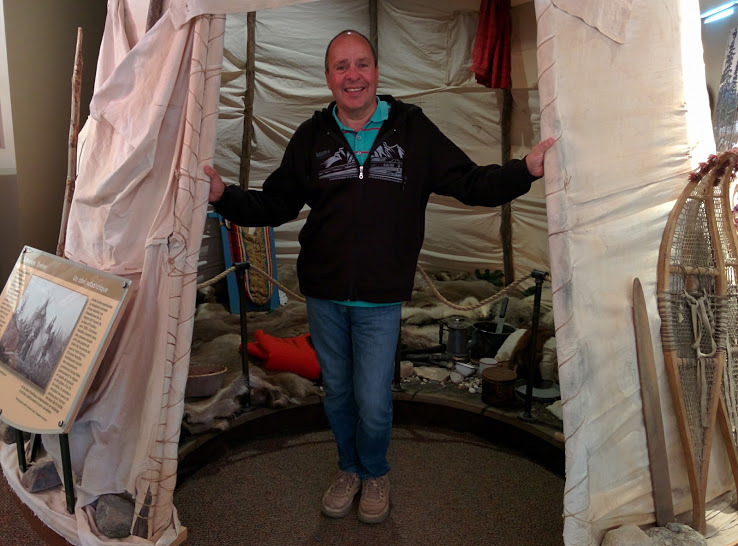 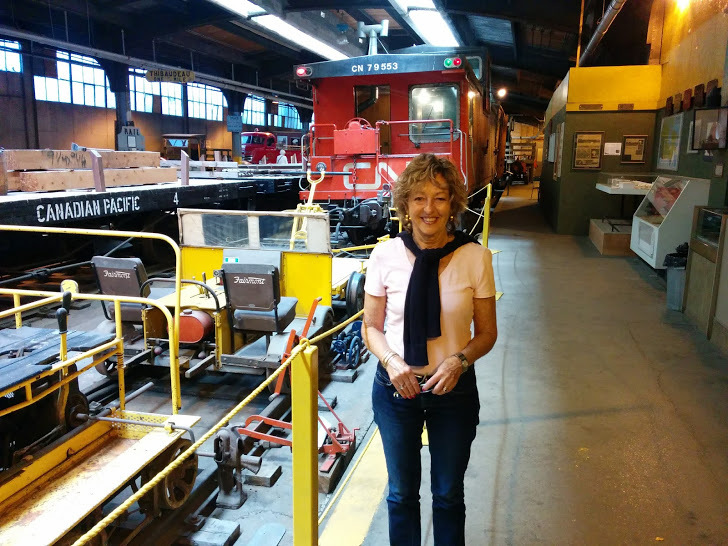 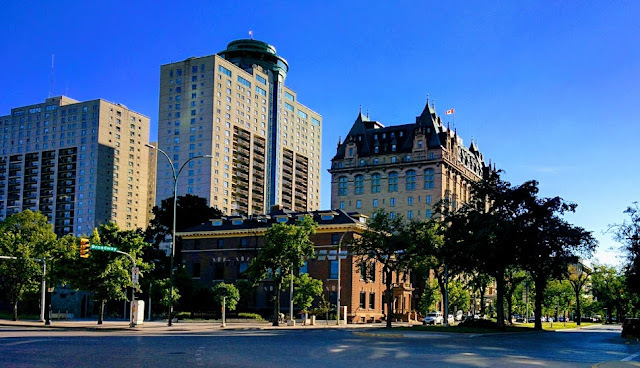 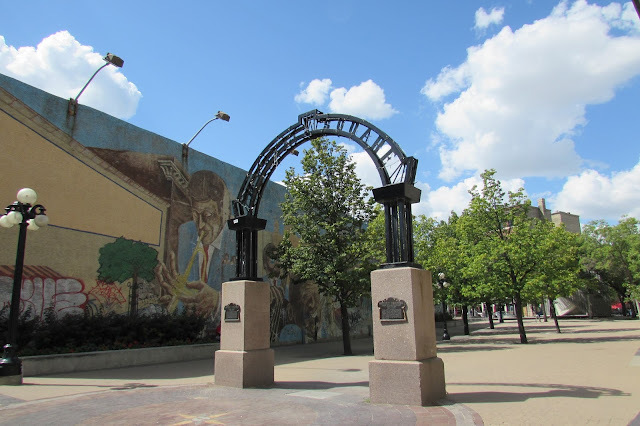 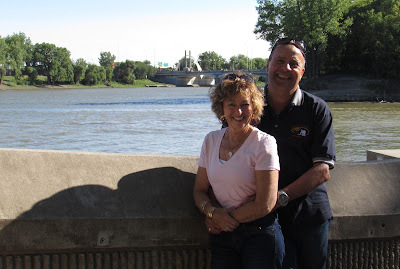 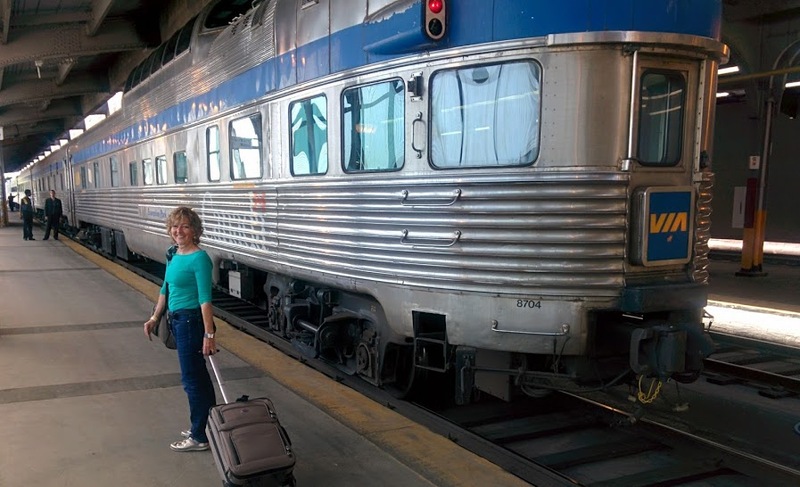 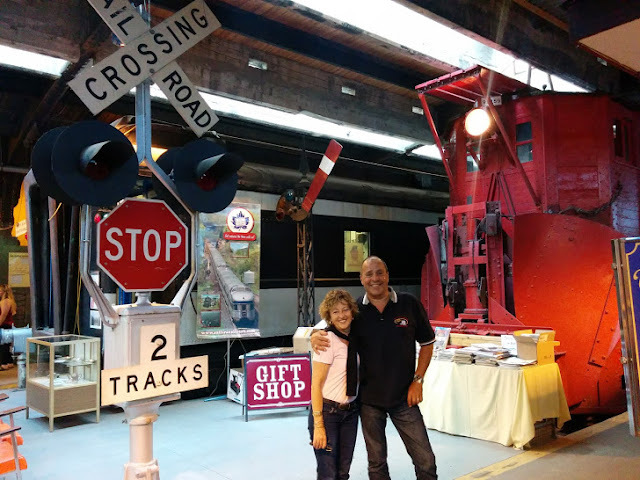 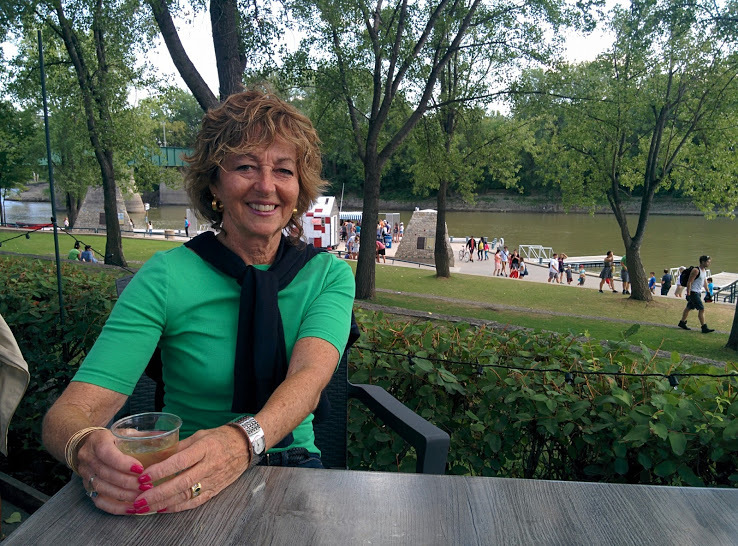 Before leaving however, we set out to explore some of the sights we missed on our last visit like the Winnipeg Railway Museum, and re-visit some of our favourites, starting of course with The Forks market. 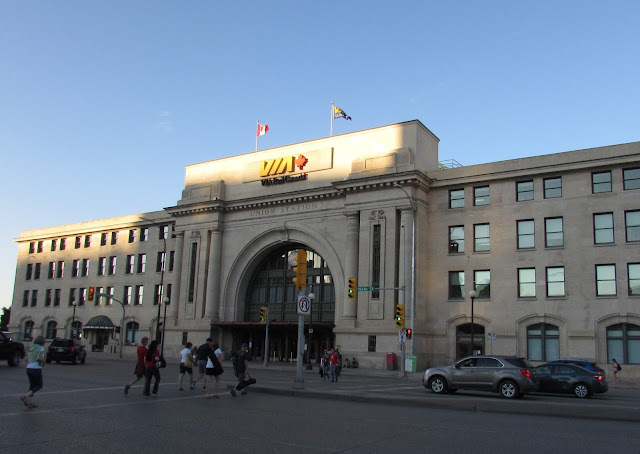 Located within Via Rail's beautifully restored Union Station, an historic building that was once an important transportation hub, the Winnipeg Railway Museum is dedicated to the history and development of the railway in Western Canada and proudly displays a variety of vintage rail cars and locomotives. 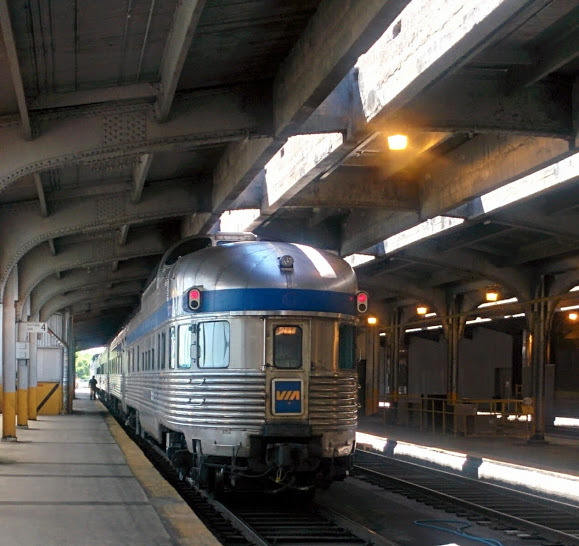 But while freight trains are still a vital component of Canada's commercial transportation network between major cities, we were soon about to discover how different the attitude is towards passenger travel and small towns. 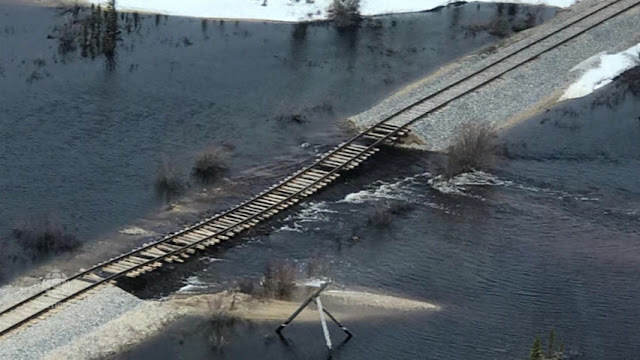 Spring floods this year caused sections of the track between Gillam and Churchill to be washed out and OmniTRAX, the current owner of the Hudson Bay Railway, decided to shut down the line indefinitely rather than repair it thus cutting Churchill off from its only ground transportation link. 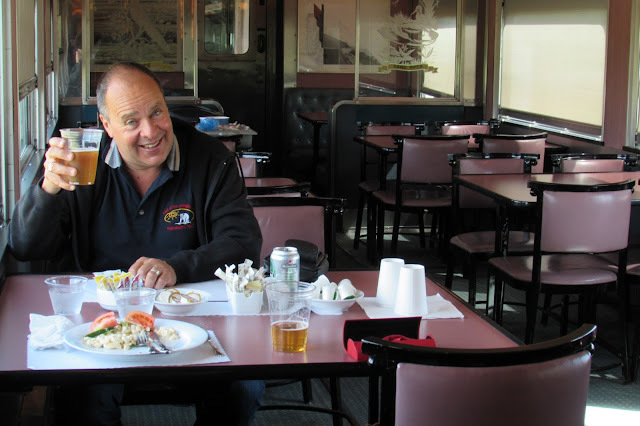 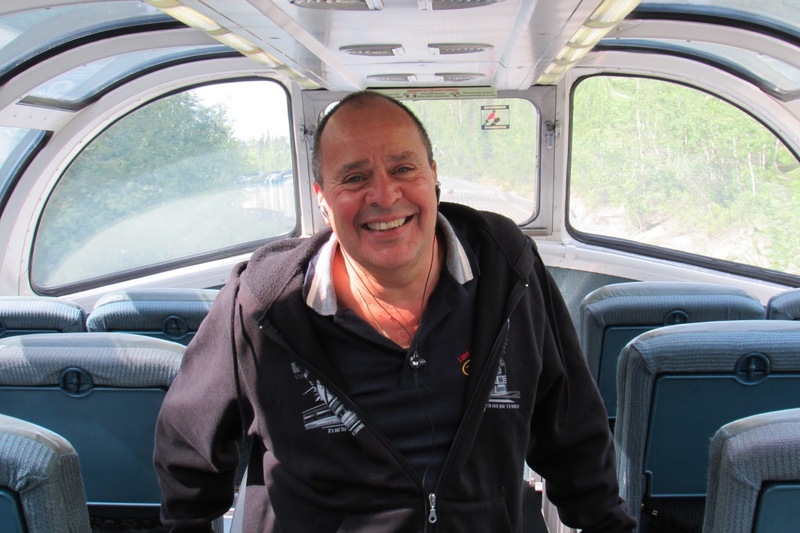 While washouts are something railways normally have to deal with as part of their maintenance efforts, OmniTRAX decided to play politics instead and see if either the provincial or federal governments would bow to pressure from Churchill and pick up the tab. 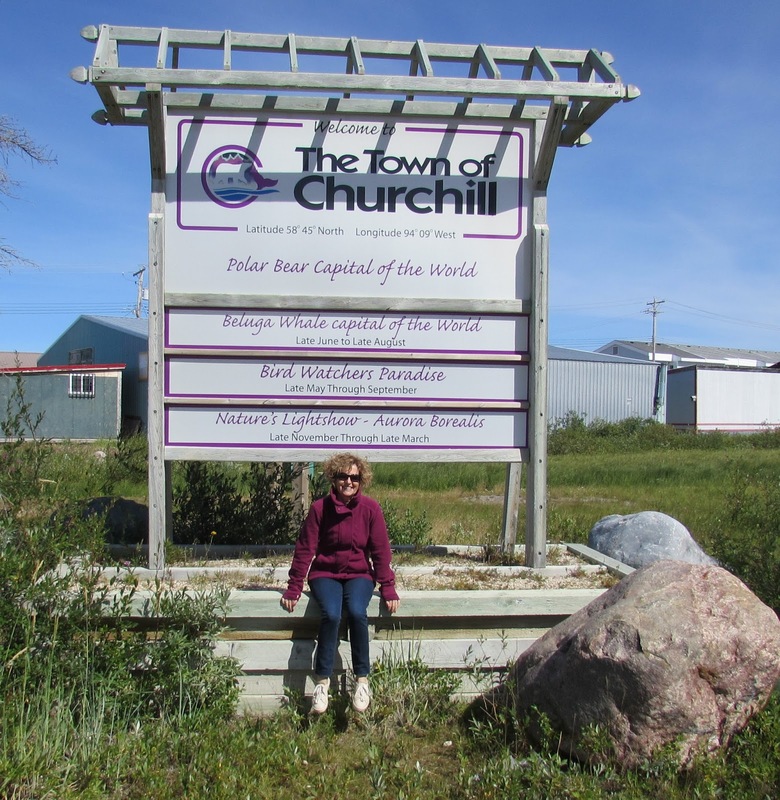 This has decimated the Churchill tourism industry and radically raised prices for all of the town's food and supplies as everything now has to be flown in at a much greater expense. 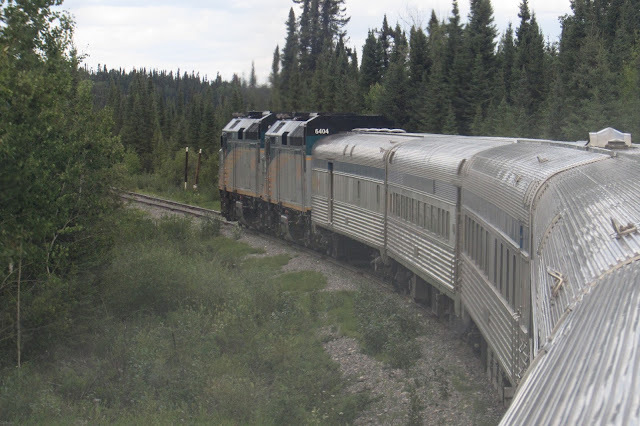 Via Rail, which leases use of the railway line from OmniTRAX, estimates that normally 2,700 people take the train from Winnipeg to Churchill between the months of June and August and the same amount again in October and November. 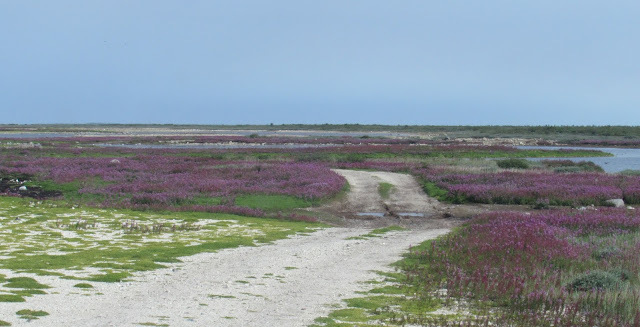 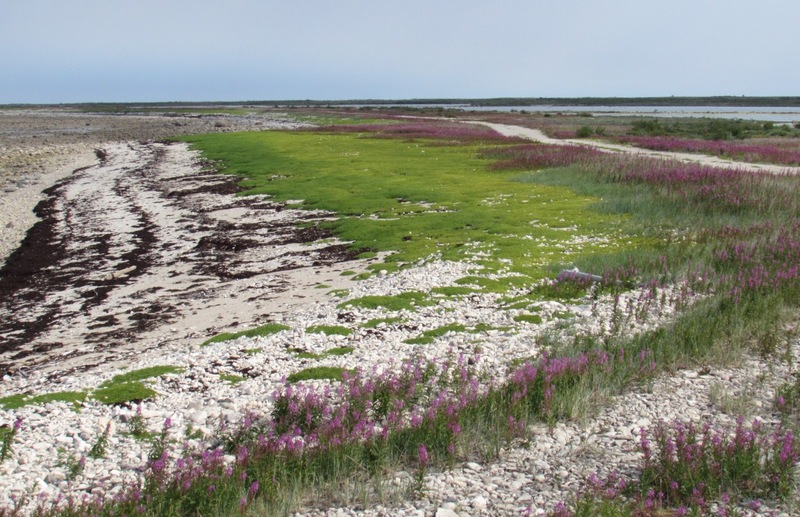 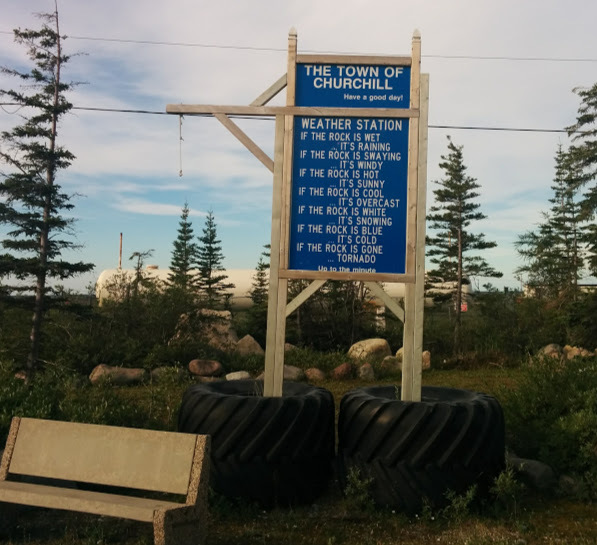 While airline flights are available they are much more expensive and not nearly as scenic and already over 1/3 of the hotel bookings in Churchill have been cancelled for the summer as people decide to wait another year. What people will decide to do in the fall is still up in the air. 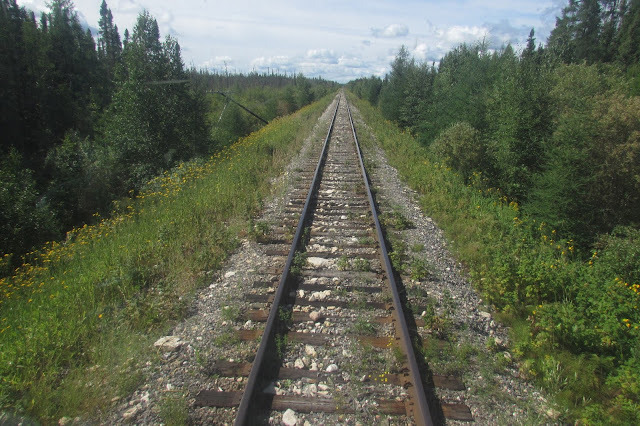 There was, however, a compromise solution and that was to take the train as far as Thompson Manitoba and catch an aeroplane for the final leg to Churchill. 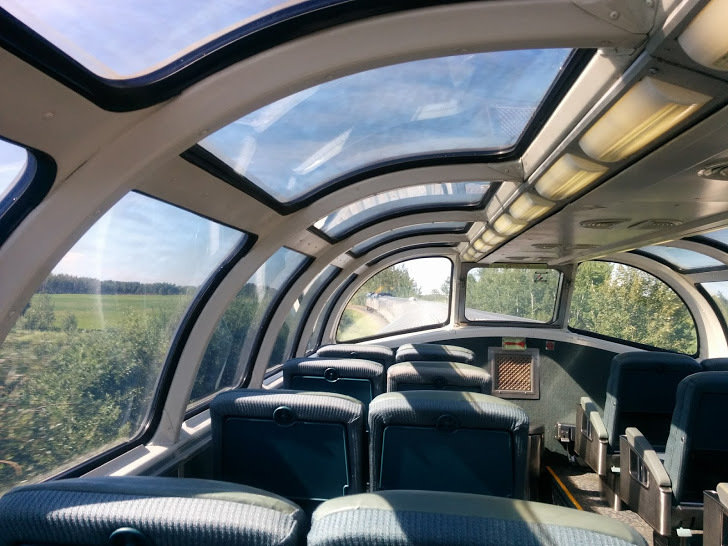 This should have been the joint solution offered by Via Rail and Calm Air, which would have been to everyone's benefit but, for whatever reason, the marketing departments of these two organizations couldn't get it together and they both lost the bookings. 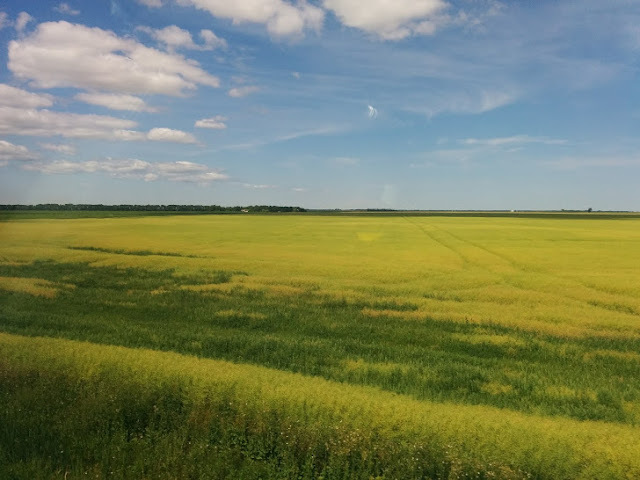 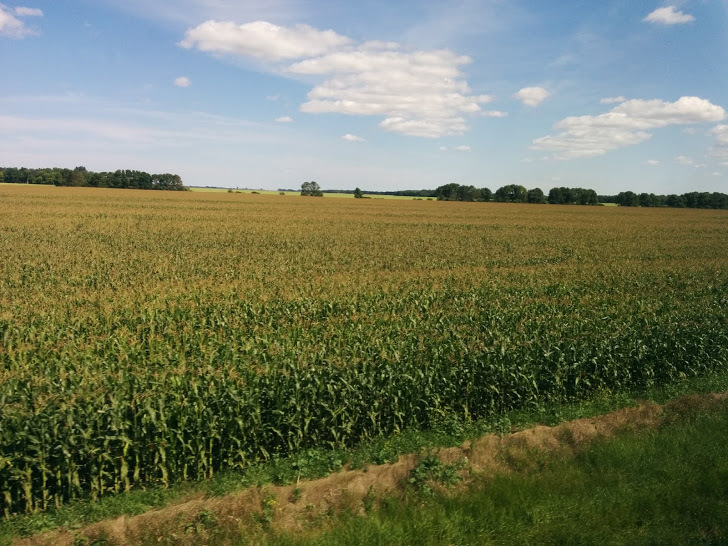 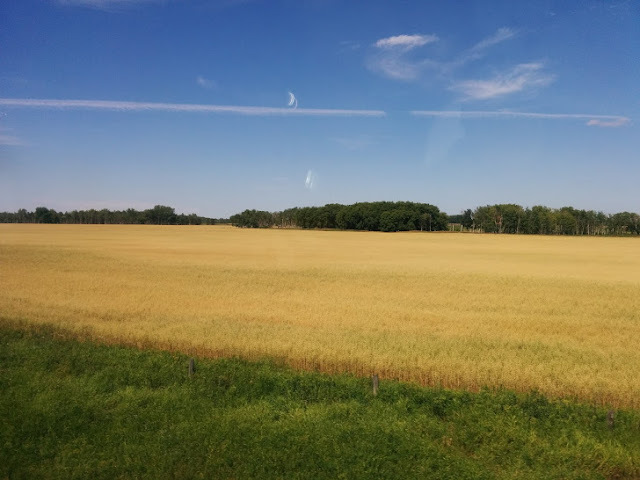 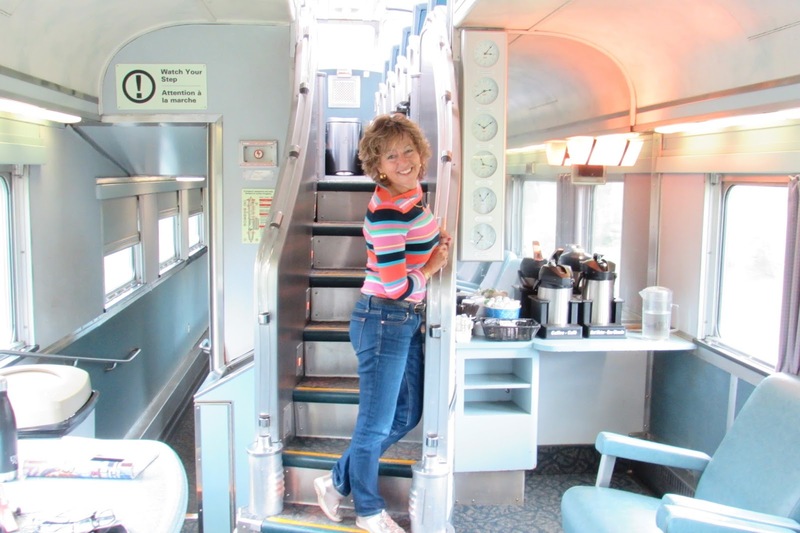 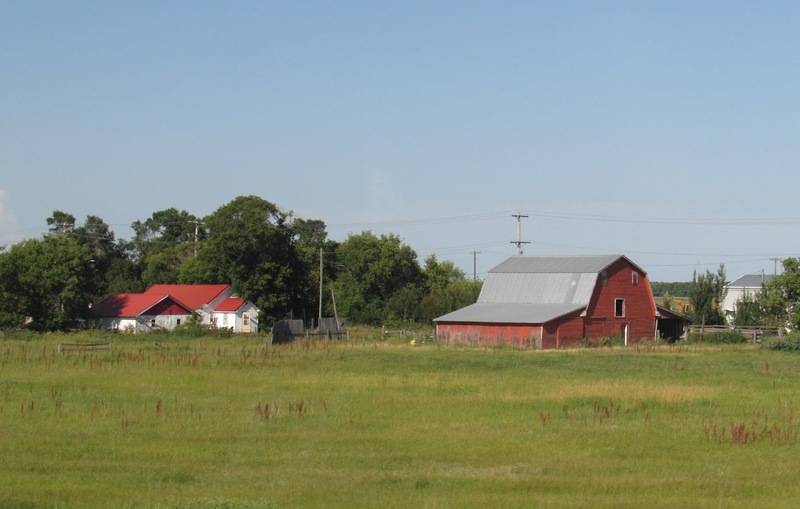 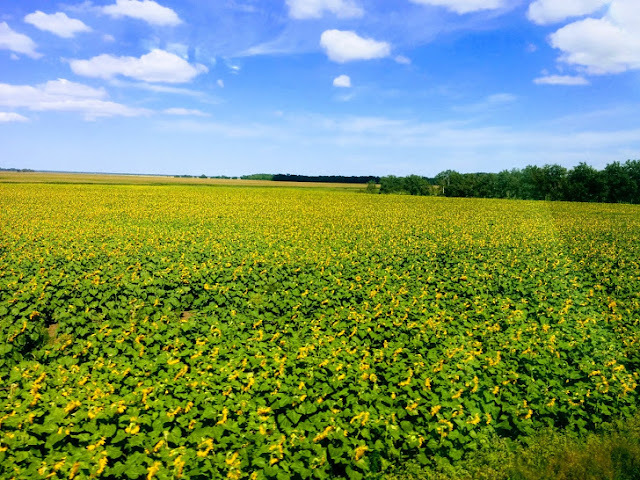 Thankfully we figured it out and had a train practically to ourselves as we headed out across the Canadian prairie with its beautifully ripening fields of wheat, barley, soybean, hay, corn, canola, and sunflowers. 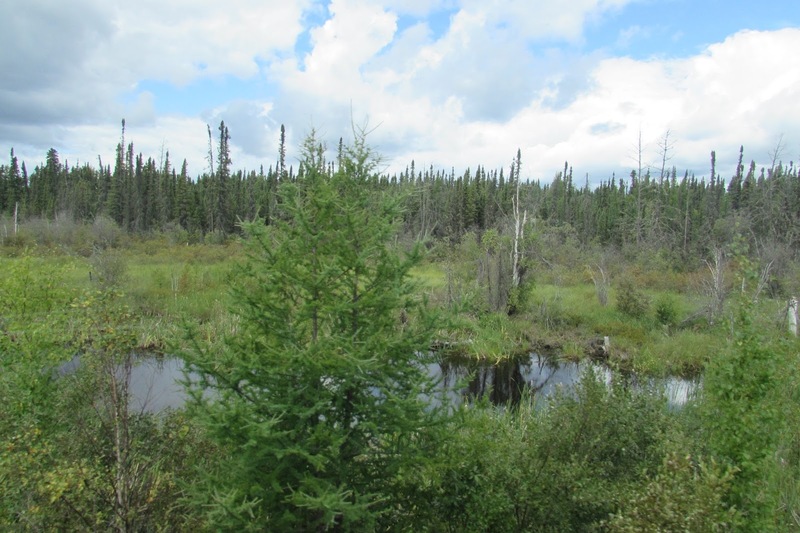 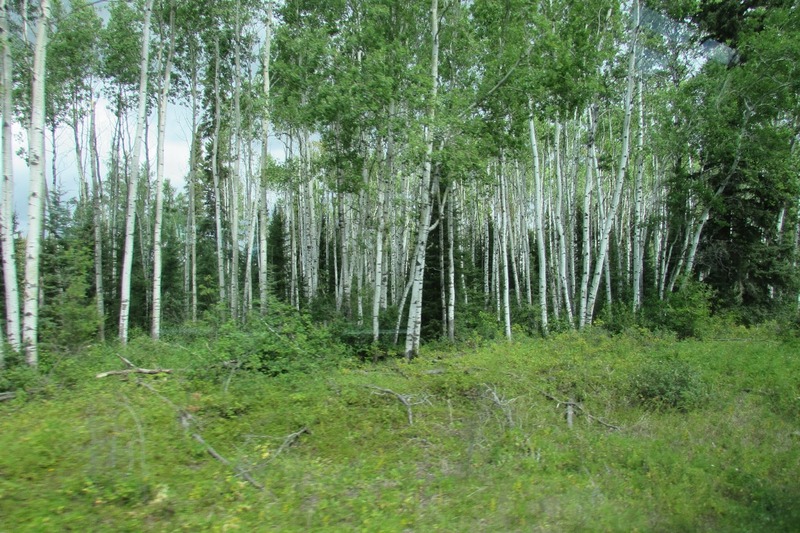 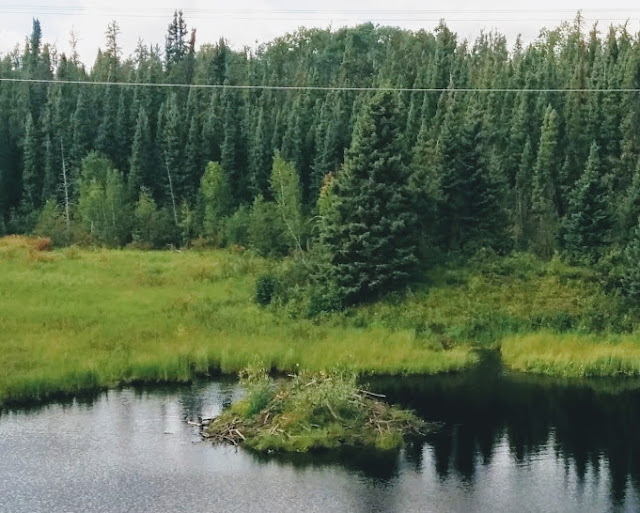 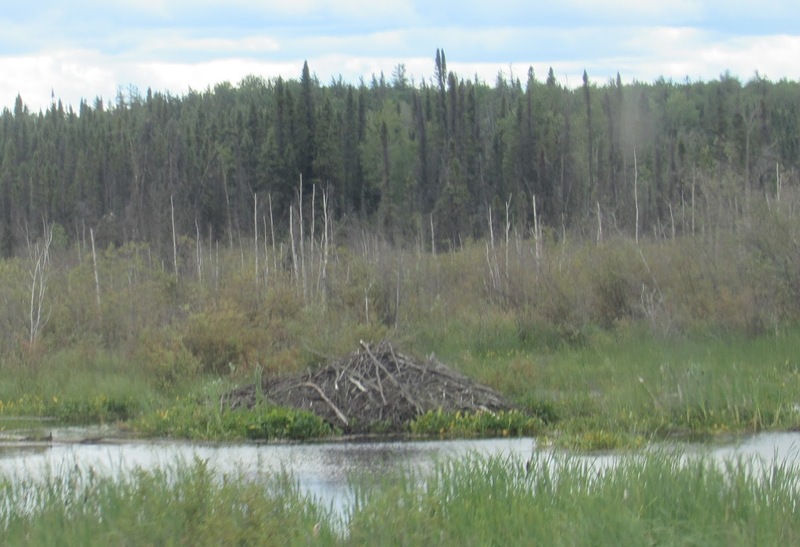 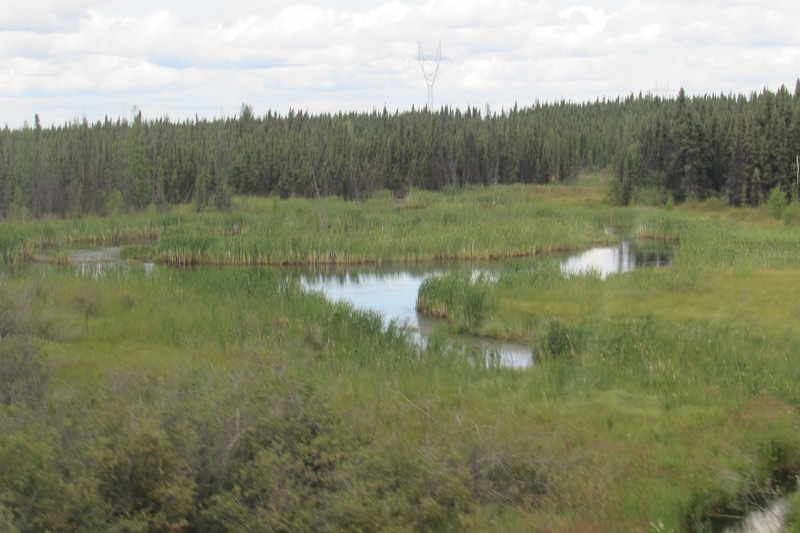 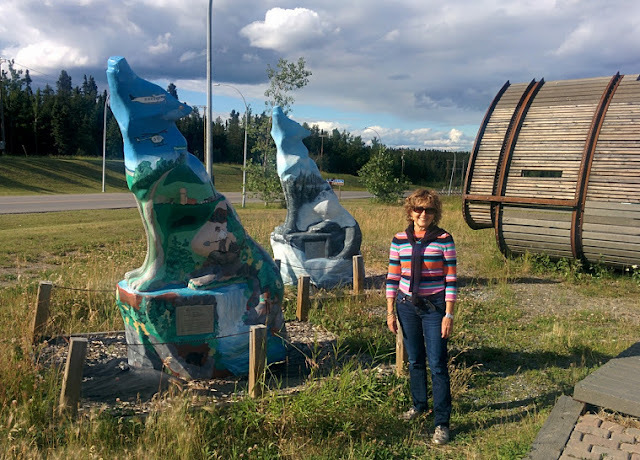 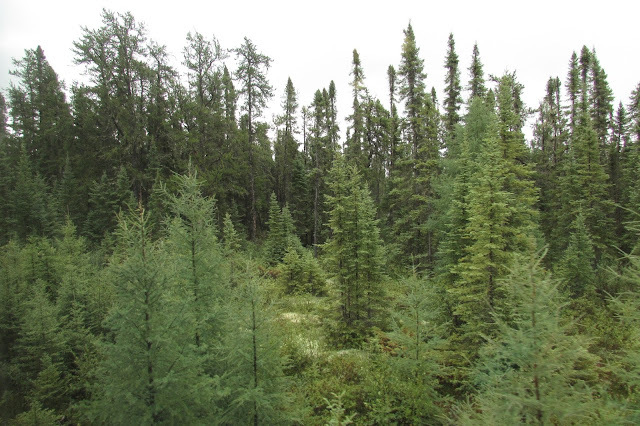 We awoke in the pulp & paper town of The Pas, "Gateway of the North" having left the prairies and now back in the very familiar Canadian boreal forest dominated by spruce trees and interspersed with vast wetlands. Moose, bear and beavers call this their home, along with millions of bugs, but it also has a special beauty the camera can't seem to resist. 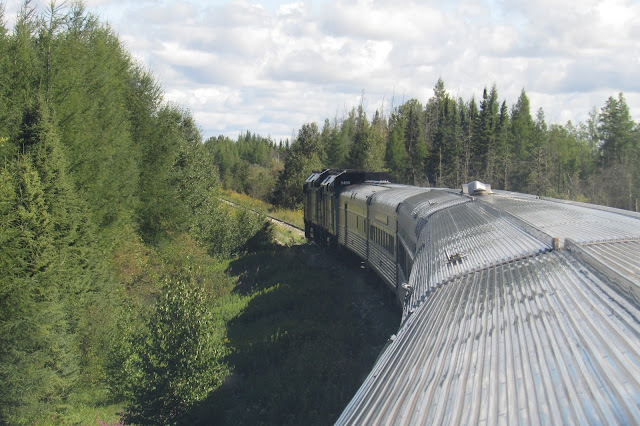 At Thompson we said goodbye to our train and set out to explore the sights. 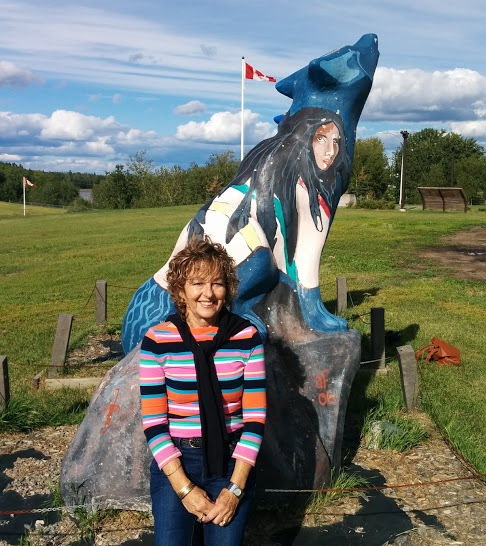 Thompson is referred to as the "Hub of the North" and, with a population of 13,000, is twice the size of The Pas with an industry centred on the mining and refining of nickel. 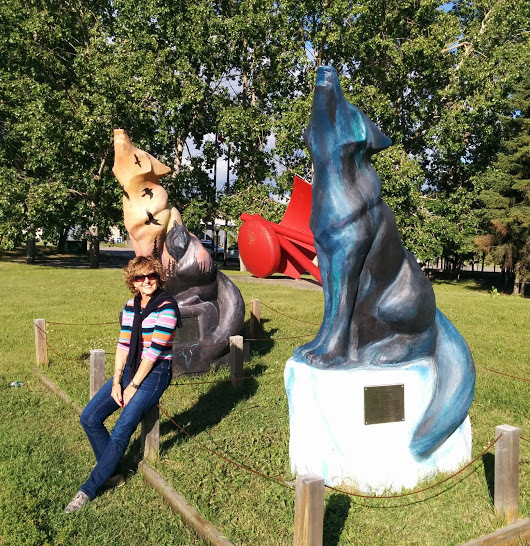 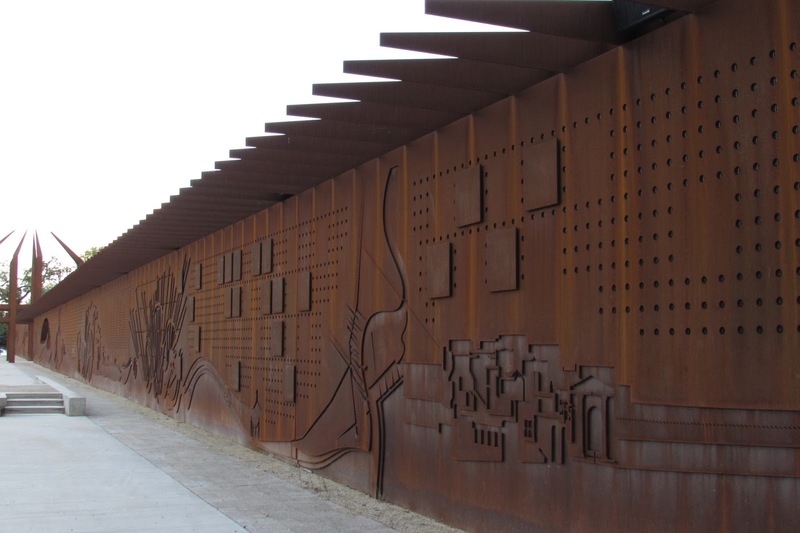 The principal tourist attraction is the Spirit Way, a 2 kilometre walking pathway with over 20 painted wolf statues placed strategically throughout the walk. 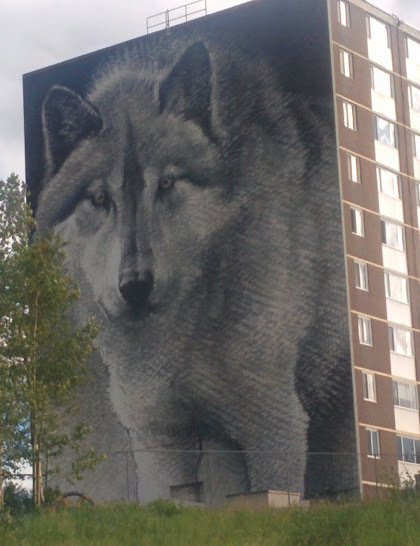 The end of the walk culminates with a wall mural (painted on the most prominent building in the city) reproduction of Robert Bateman's "Wolf Sketch" and is the largest photo-real mural in Canada. 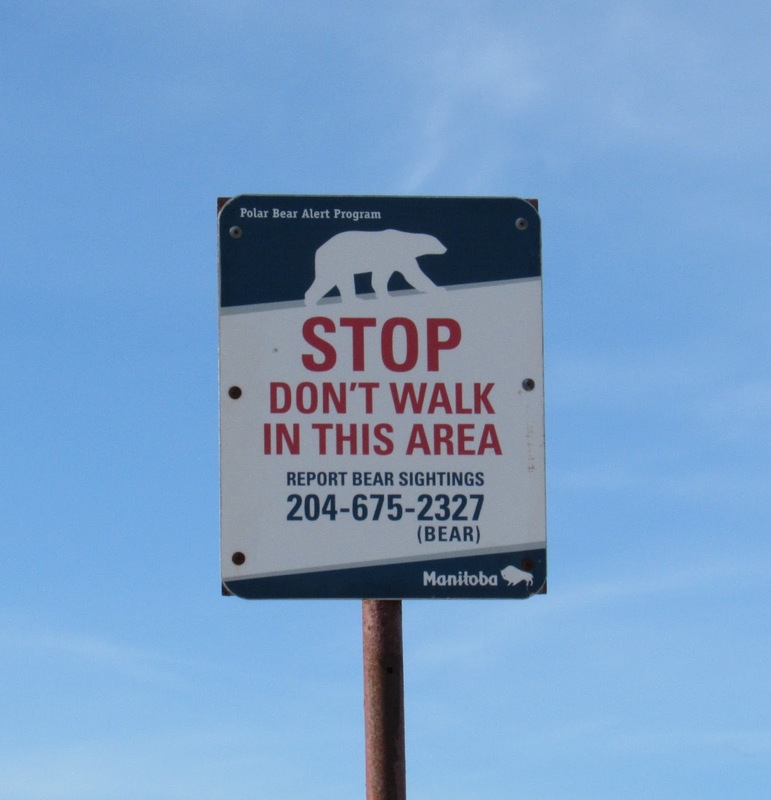 The next day we arrived at last in Churchill, a very unique town of under 1,000 people located on the shores of Hudson Bay and referred to as "The Polar Bear Capital of the World". 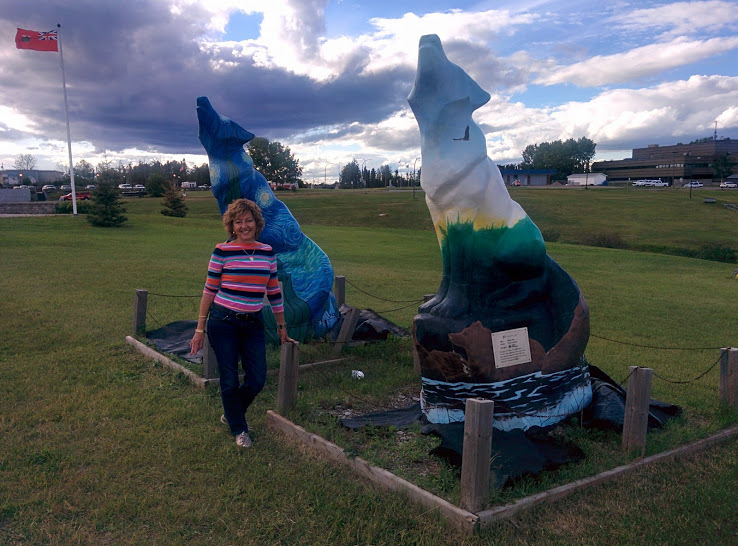 Everywhere you go there are statues of polar bears, signs warning you of polar bears, and stuffed polar bears to pose with. Since the 1980's a sizeable tourism industry has developed based on the migration pattern of polar bears which come to the area in October and November by the hundreds to wait for the water on Hudson Bay to freeze so they can return to hunt seals. After our ride into town the first stop was the Parks Canada tourist office located in the very quiet and now empty train station with the stranded pedestrian train still waiting on the tracks. 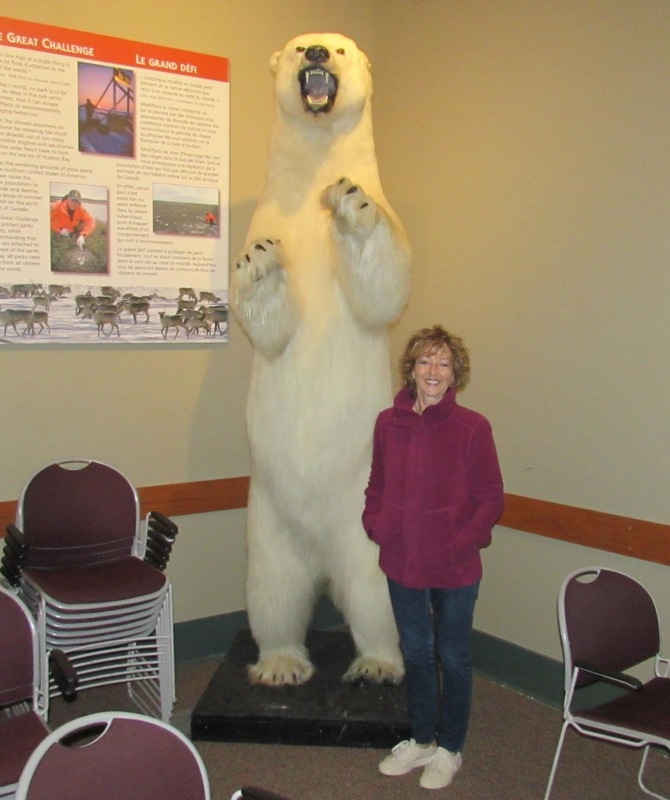 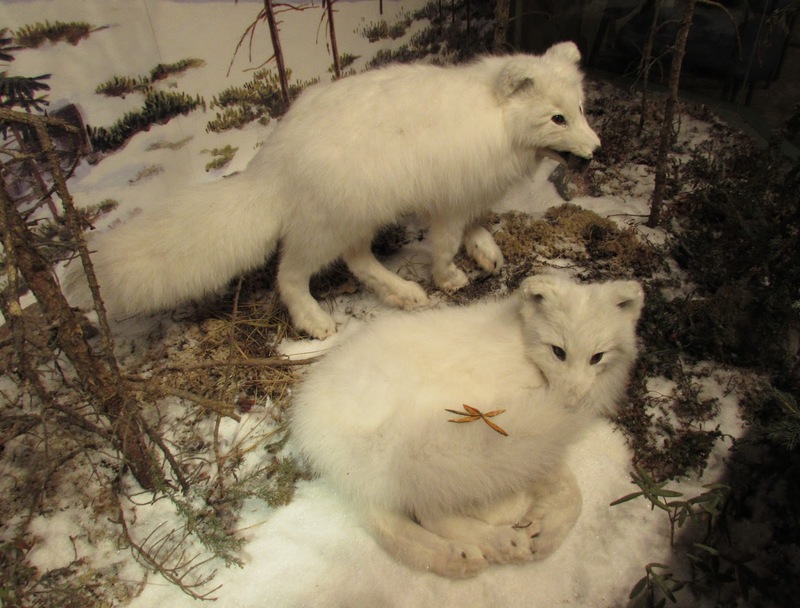 But it had a great exhibit of the wildlife in the area along with some of the historical items, including of course, a polar bear to pose with. 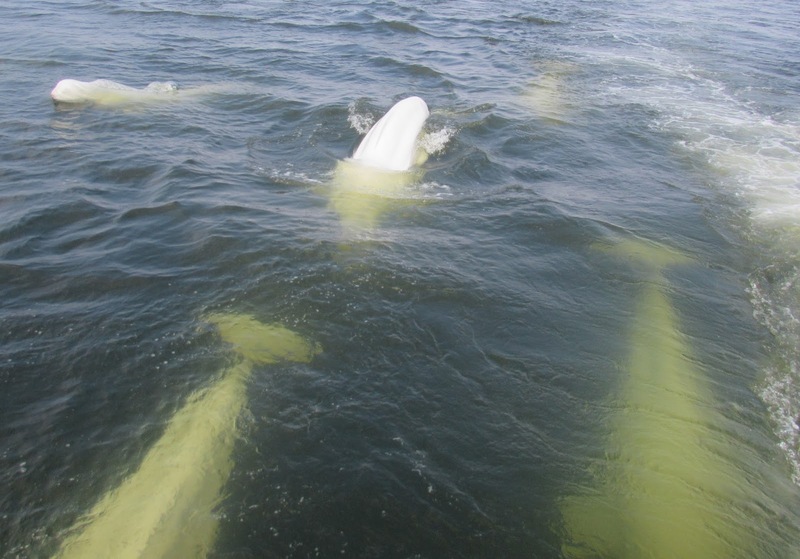 While polar bears may be the rage in autumn, in summertime it's all about the beluga whales. 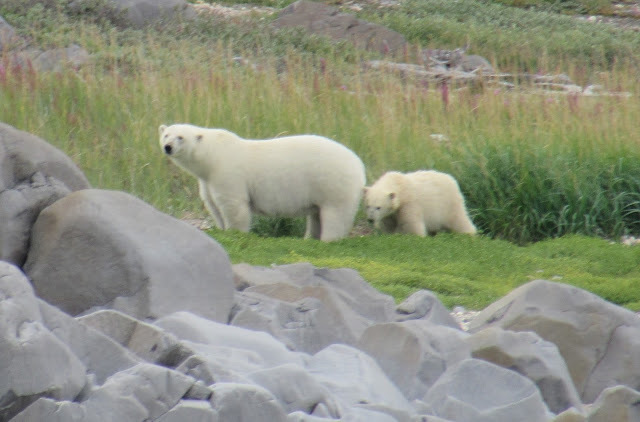 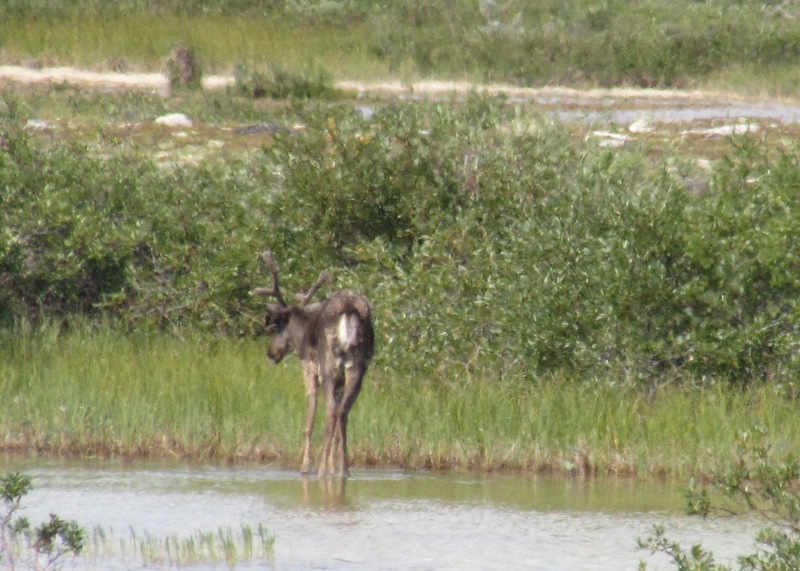 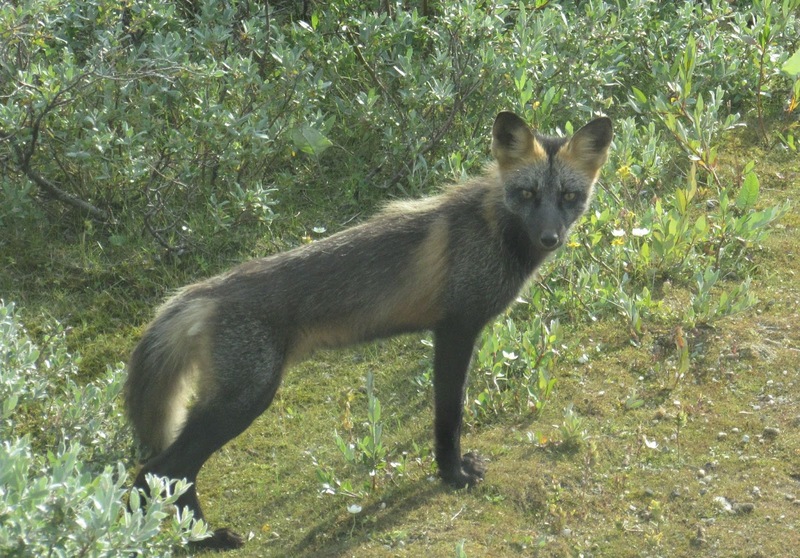 They come to Churchill, by the thousand, to feast on the capelin spawning in the mouth of the Churchill River, moult away some old skin, and give birth to their young before returning north to the Arctic Ocean in the fall. 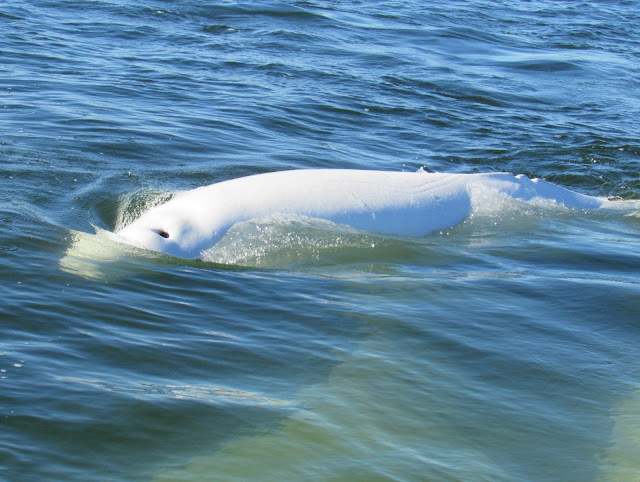 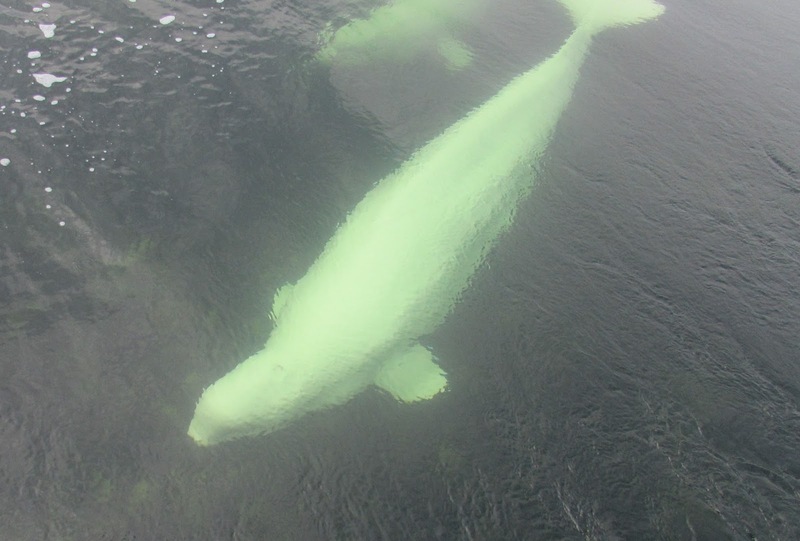 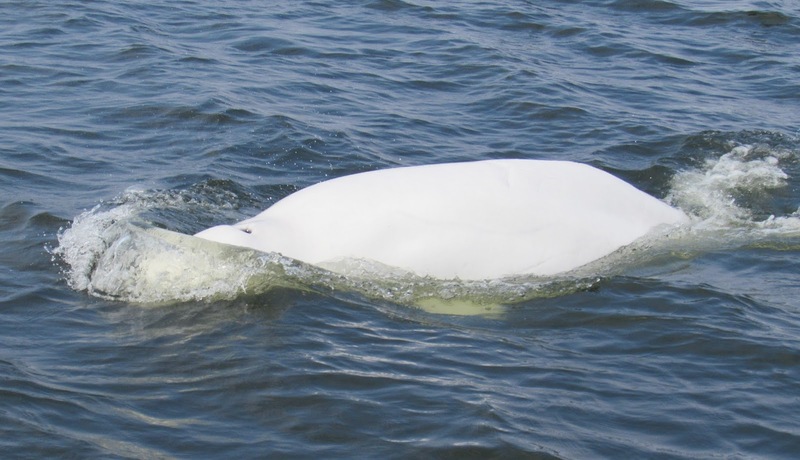 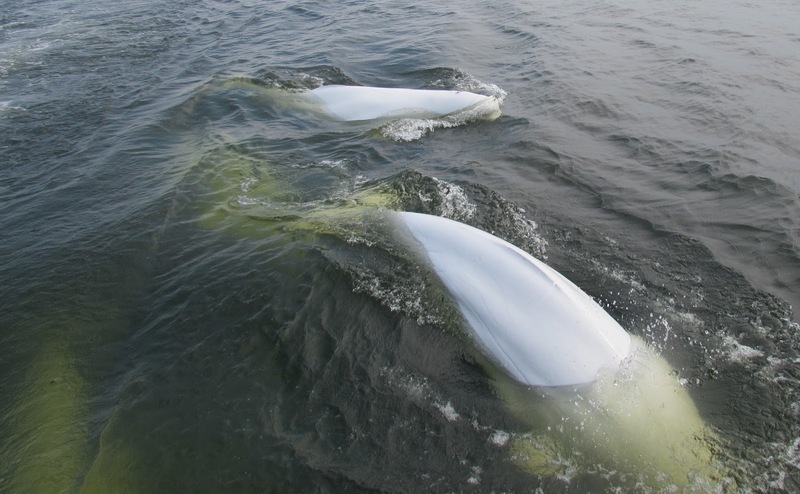 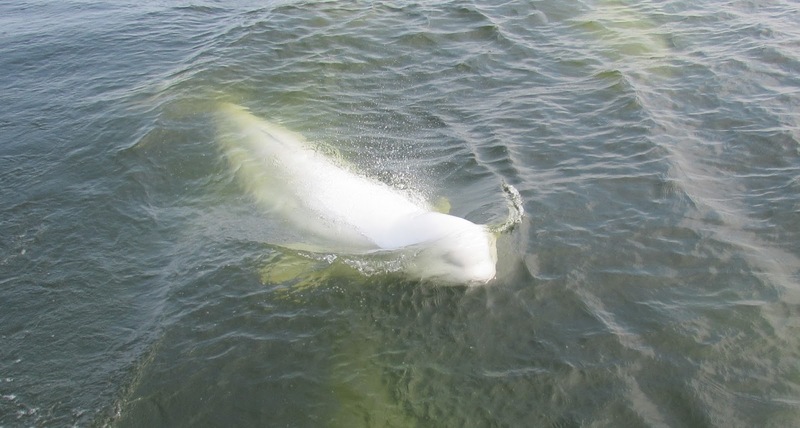 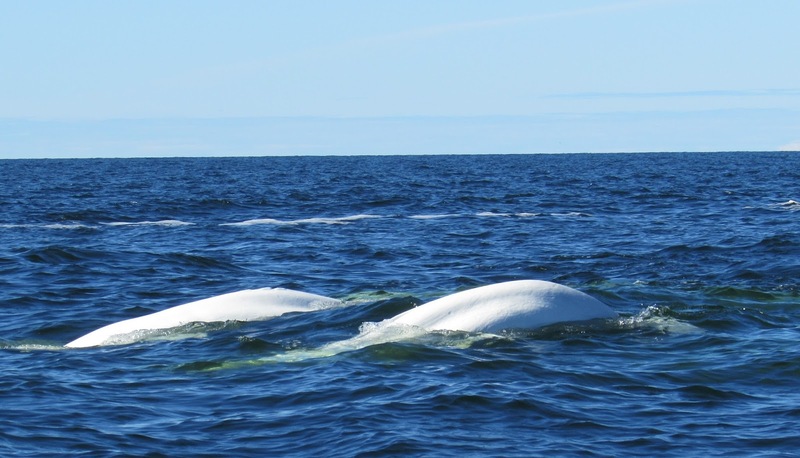 While there are an estimated 60,000 belugas in all of Hudson Bay at least 3,500 of them come each year to Churchill. 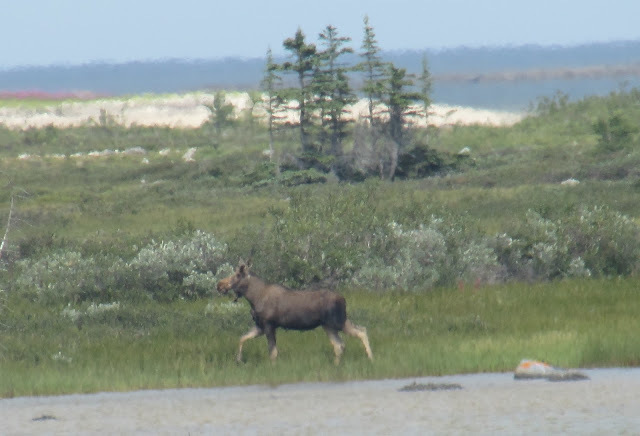 Walking along the beautifully rugged and rocky shoreline we could see them out in the ocean swimming like dolphins as they played in the surf and called us to join them. It was only when we got back onto the roadway did we see the polar bear warning signs. 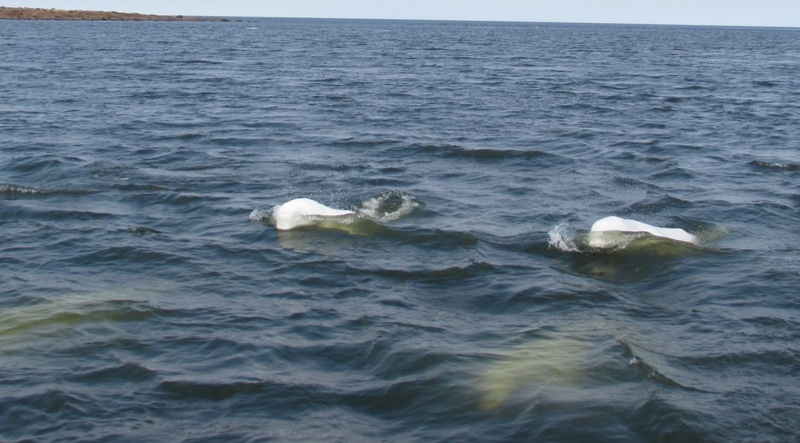 The belugas were waiting and it didn't take me long to get dressed up in a warm 7mm wetsuit so I could snorkel and swim with them. 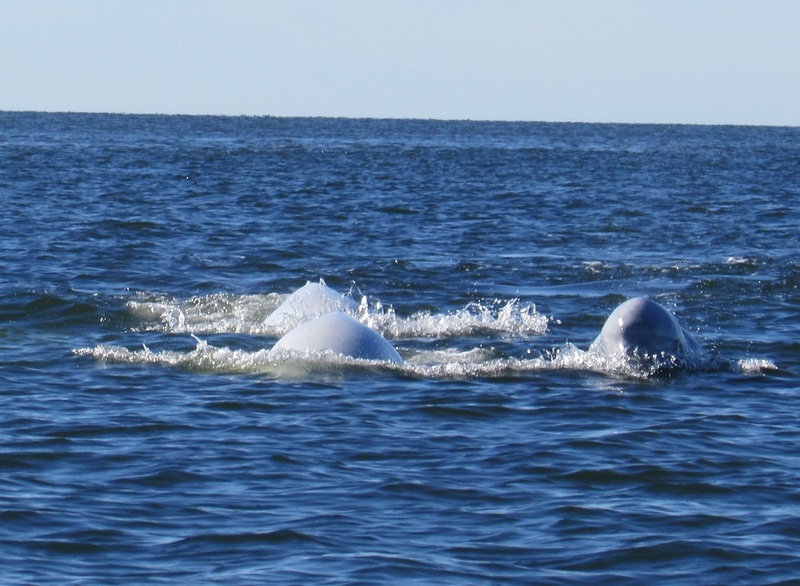 Highly sociable, gentle giants, that are extremely friendly, playful and curious, belugas travel in pods of around 10 and can be heard chirping, whistling, and beeping under water, as they come near. We hadn't even left the dock and they were all around the Zodiac wanting us to stop and jump in with them. 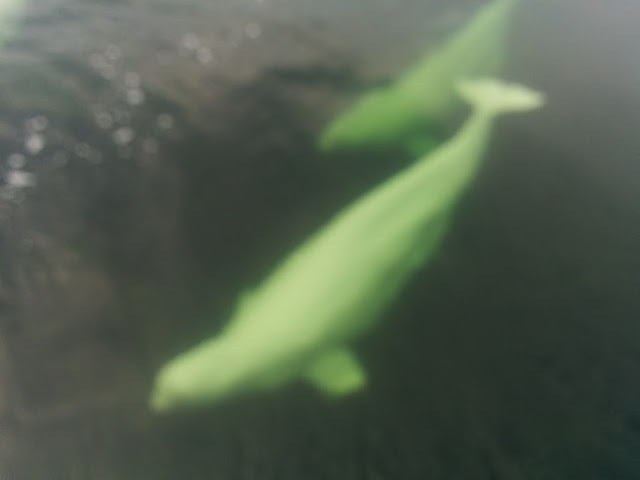 Happy to oblige I spent the next 2 - 3 hours singing my heart out to their favorite Beatles songs, and watching as they swam underneath looking up at me with their big smiling faces. 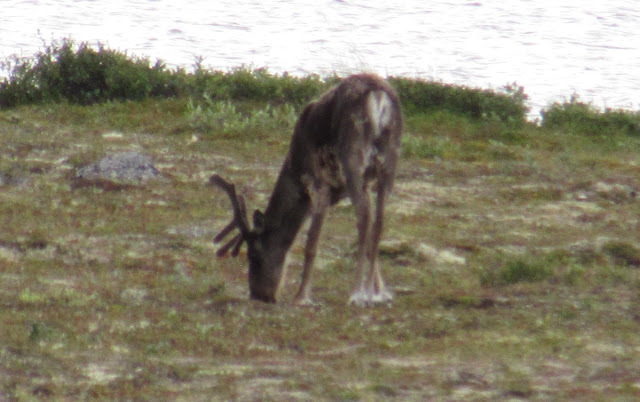 I even had a mother come by to show off her new born calf that was riding on her back. Churchill was originally a Hudson's Bay trading post built in 1717 to facilitate trade with the Dene people and stay out of reach of York Factory where the Cree traded. 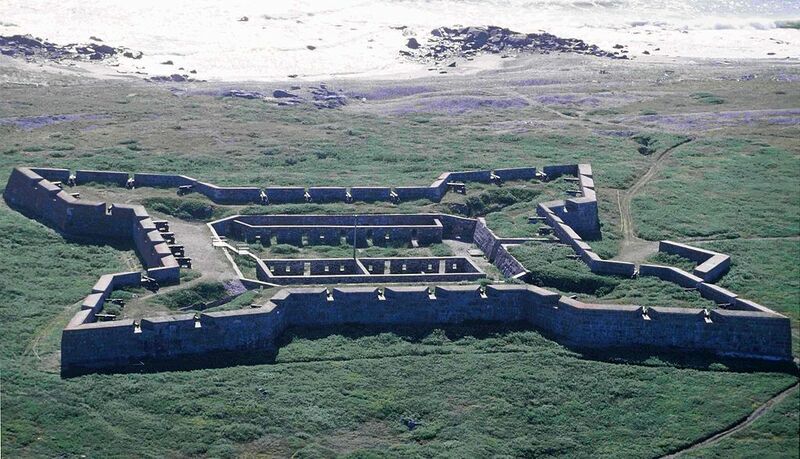 The original settlement was replaced by the Prince of Wales Fort built between 1731-1741 and is now an historic site maintained by Parks Canada. 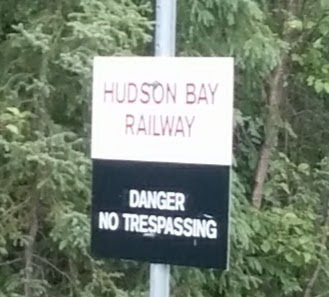 A good lookout post over Hudson's Bay, that never lived up to its potential, nonetheless offers a perfect view of all the action in the Bay. Inuksuk is an Inuit word for "that which acts in the capacity of a human" with inuk meaning person. 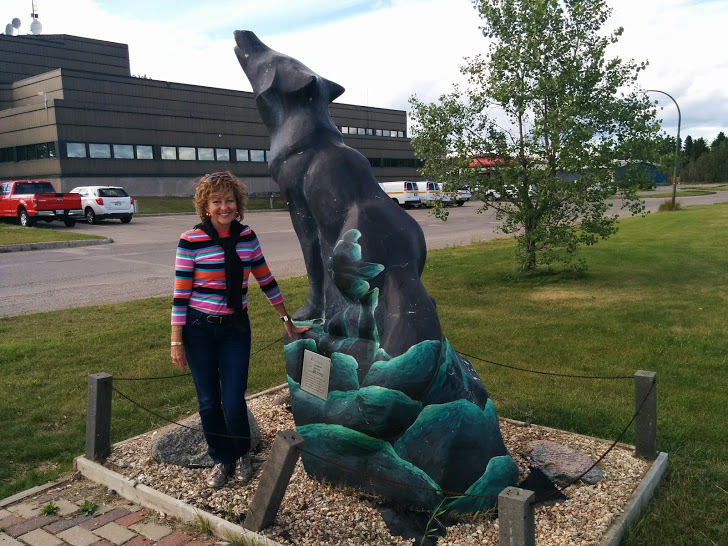 It's a human-made stone landmark used for navigation, a point of reference and to assist in the herding of caribou for slaughter. Obviously the inuksuks around Churchill were built with the aid of machines but they still point to their connection with the north and the people who originally lived in this area. 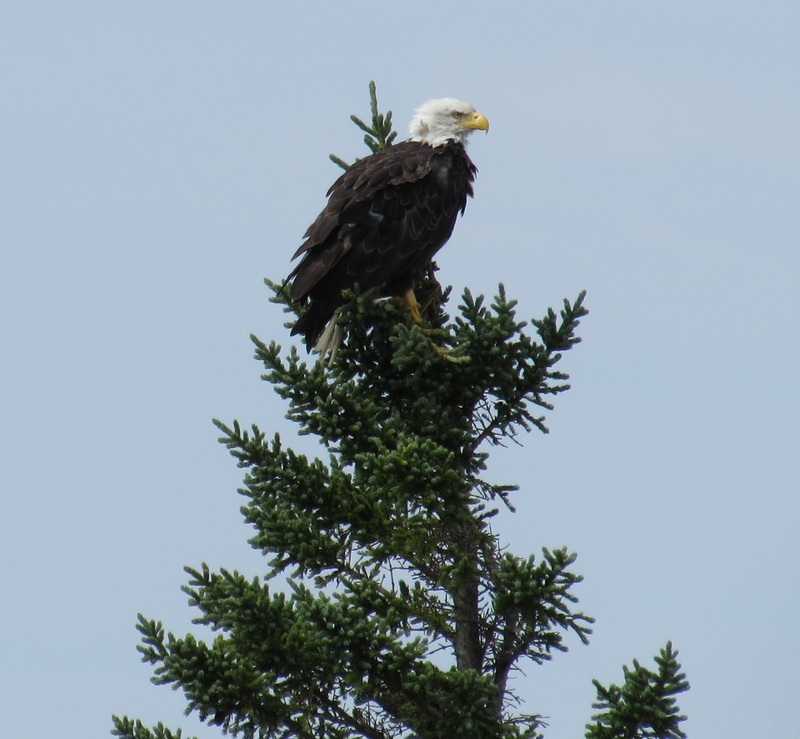 They also make for great photo opportunities. 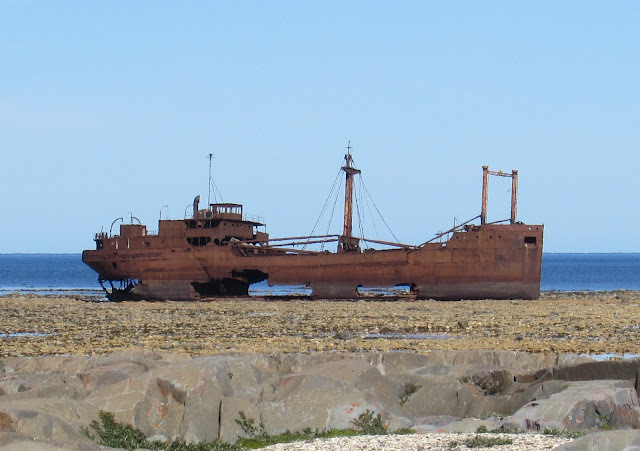 Other interesting points of interest and photo opportunities include the boat Beluga, the crashed aeroplane Miss Piggy, and the grounded shipwreck MV Ithaca. 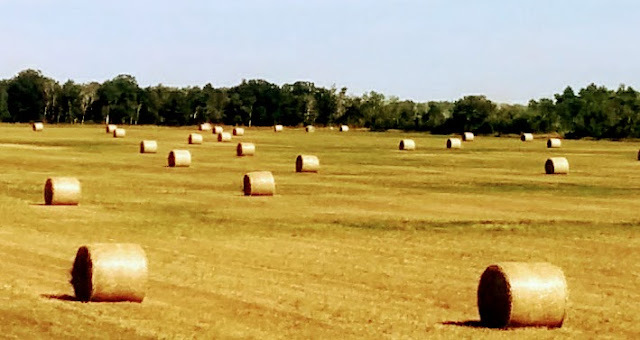 Each one has its own sordid story with different versions of what really happened but, in each of the cases nobody was hurt and time will eventually erase both the memory and the evidence. With the decline of the fur trade Churchill faded into obsolescence until it was decided to build a new northern shipping harbour connected by railway to Winnipeg. This was finally completed in 1929 but it took many years before it started to get any real use and, with the recent shutdown, its future is now up in the air. In 1942 the U.S. Army Air Corps established a base that later became a Strategic Air Command facility during the Cold War until it was closed down and the airport was turned over to the city. 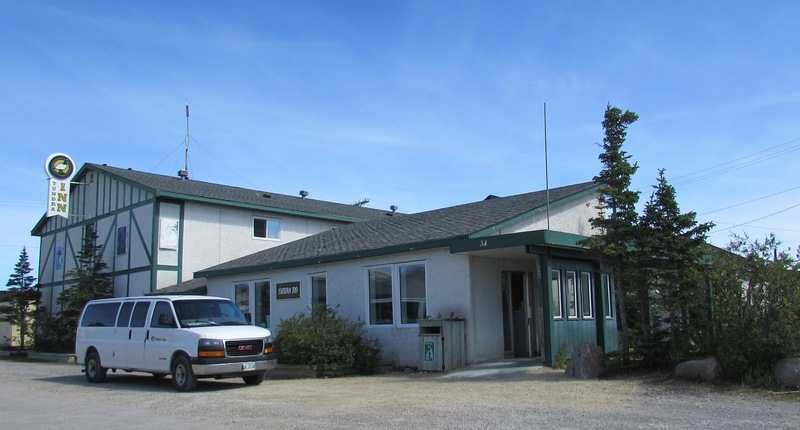 The area was also a Rocket Research Range for atmospheric research that started in the 1950's and eventually closed down in 1984. 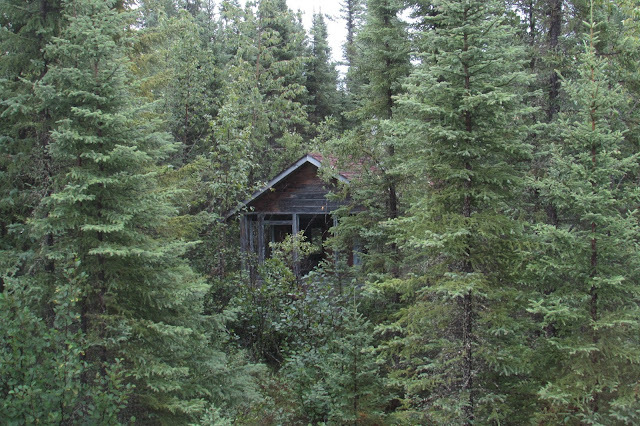 As a result of all these ups and downs in the town there are a lot of dilapidated buildings that have been left littering the landscape. 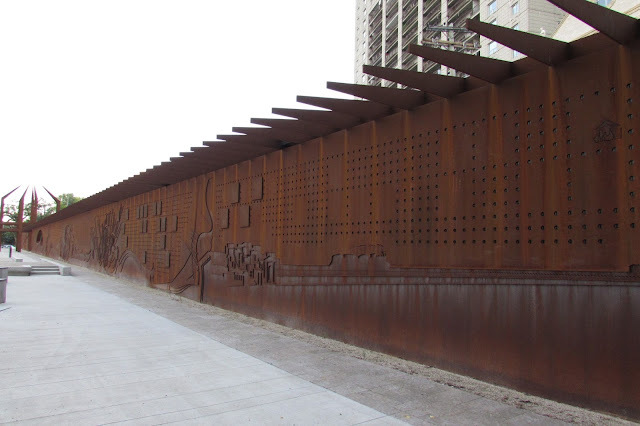 While on the one hand this mostly crumbling infrastructure is a bit depressing, it has also provided an interesting canvas for building murals. 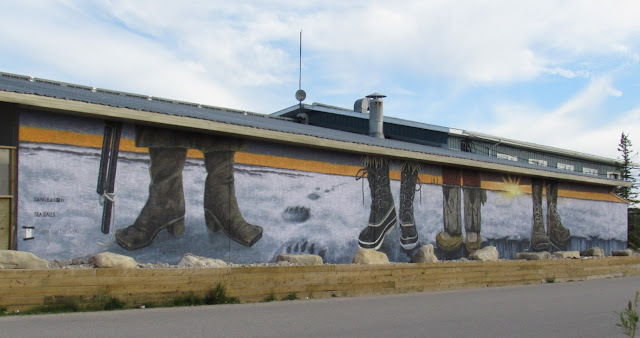 The murals aren't just restricted to abandoned buildings though, as many other local establishments have also demonstrated a desire to liven up their walls. 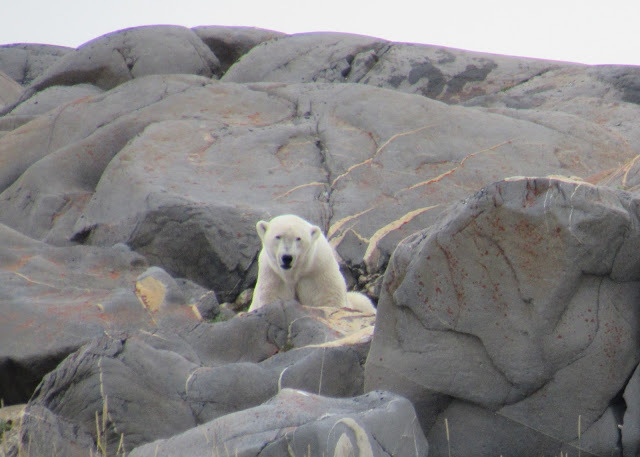 A ride on one of the tundra buggies offers an up close glimpse into life on the windswept taiga. These purpose built vehicles are the mainstay of Churchill for safe, land based touring, and they also come with an armed guide. 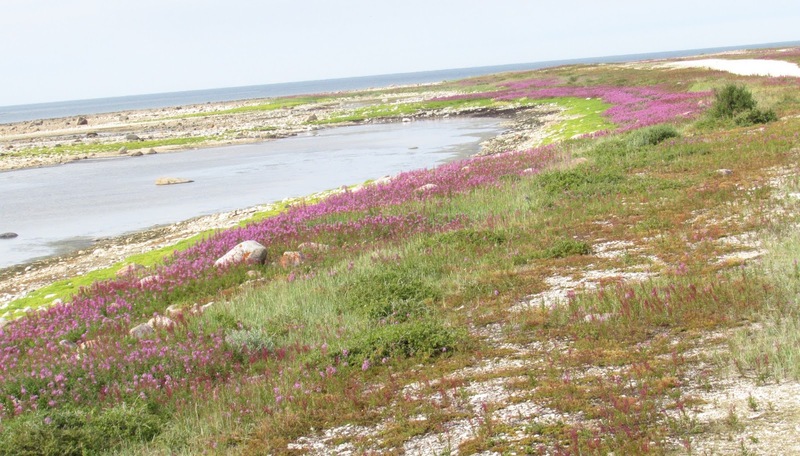 It's rugged going for most of the way but the rocky beaches and taiga have their own beauty with hardy shrubbery and colourful fireweed brightening the landscape. 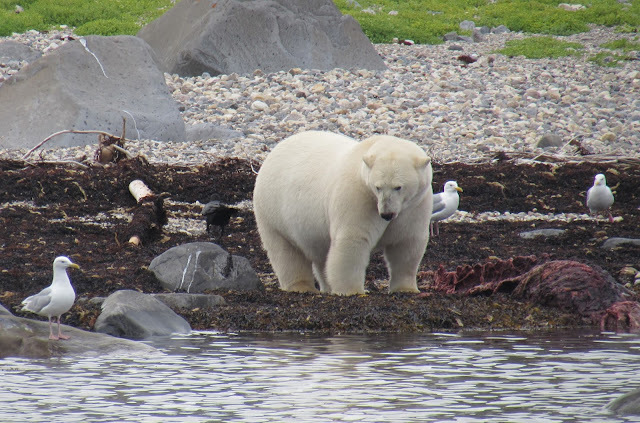 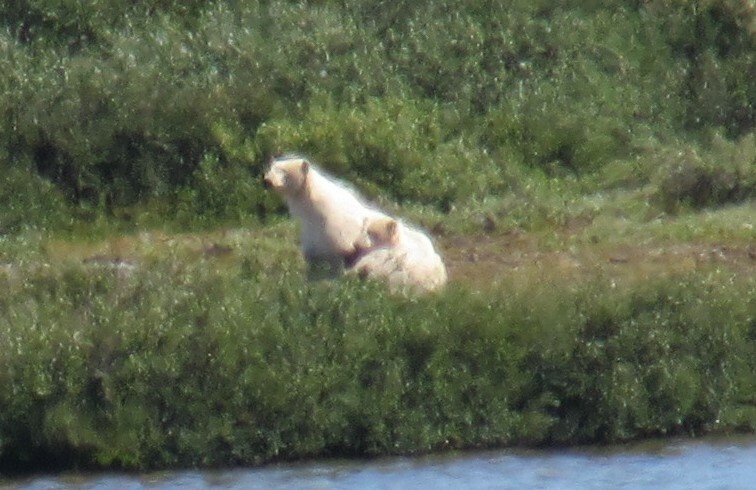 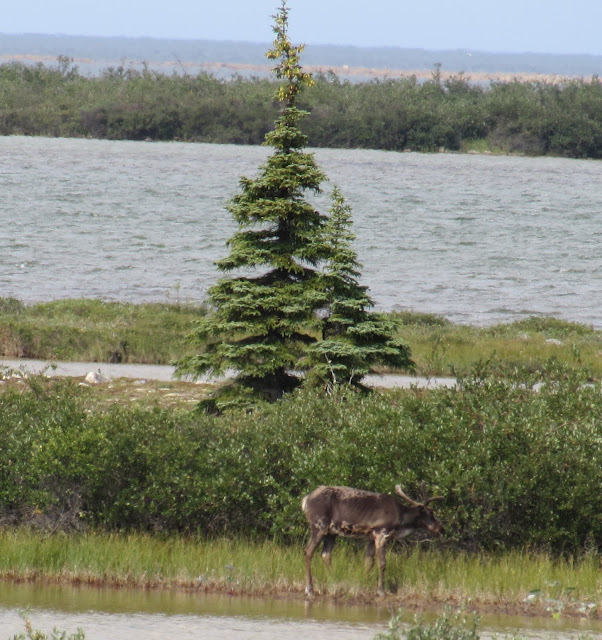 And while it's all about the polar bears who are patrolling the high tide line in search of anything to eat, there are all sorts of other creatures like caribou, bald eagles, moose, and fox who don't mind getting their picture taken if you keep a respectful distance. 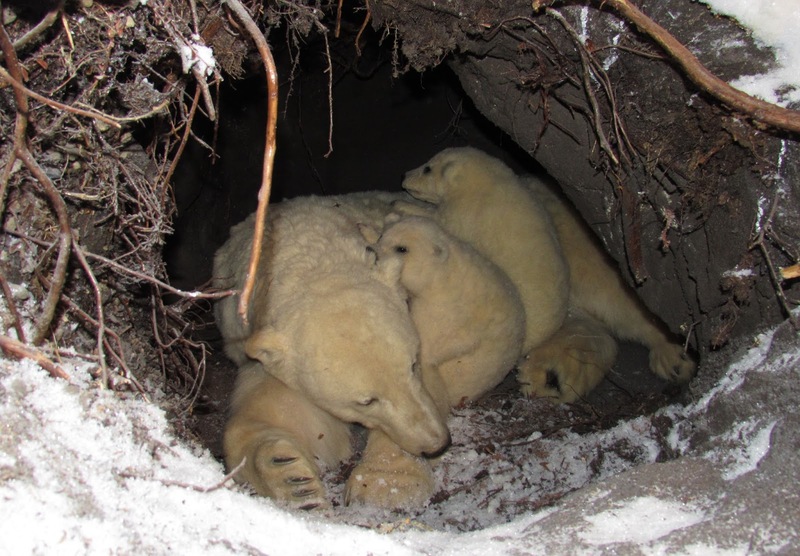 In the end we saw both a mother and her 2 year old and an "Einstein" (in the local tongue) otherwise known as a mother with 2 cubs (MC2). 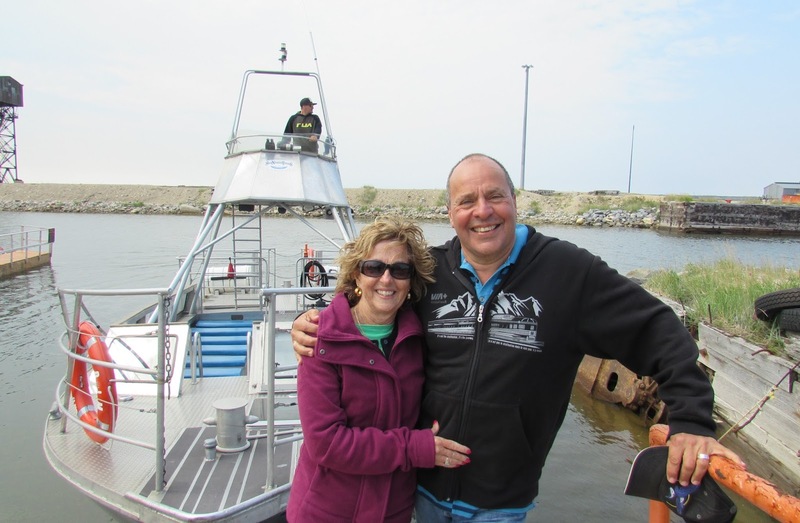 But we weren't done with the belugas just yet and, on our second outing, we went on the Sea North's custom built whale watching boat that runs on jet pumps with no underwater moving parts so no matter how close the whales get they can't be harmed in any way. This was very important because in no time we were surrounded by whales that wanted nothing else but to get under the boat and feel the bubbles. 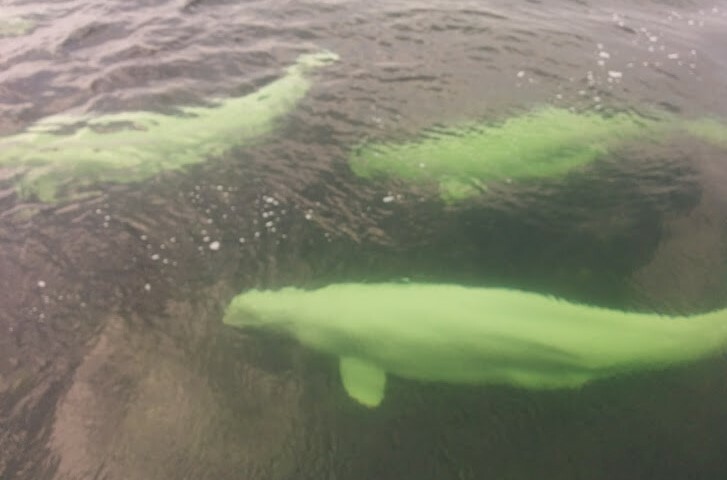 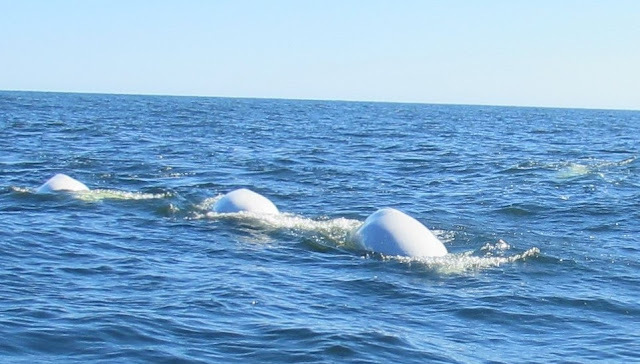 We've seen minke whales in the St. Lawrence, humpback whales in Hawaii, and of course killer whales in the west coast waters, but nothing could prepare us for the sheer number of beluga whales in Hudson's Bay. 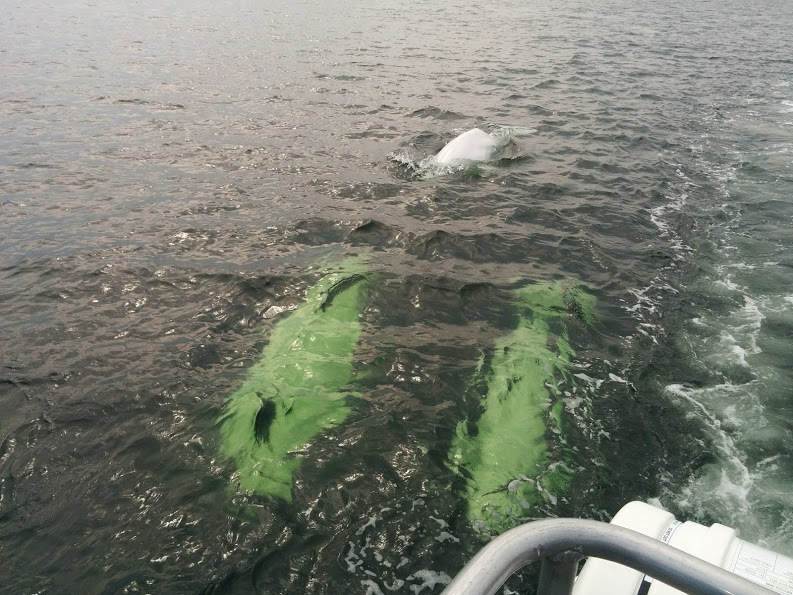 A truly magical experience as they chased us and followed both alongside and underneath the boat. 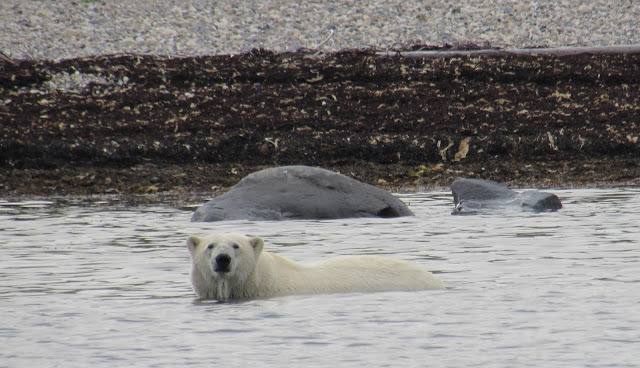 And then the grand finale as we approached the shoreline and discovered 5 polar bears lounging about as they took turns feasting on a beluga whale carcass lying on the beach. 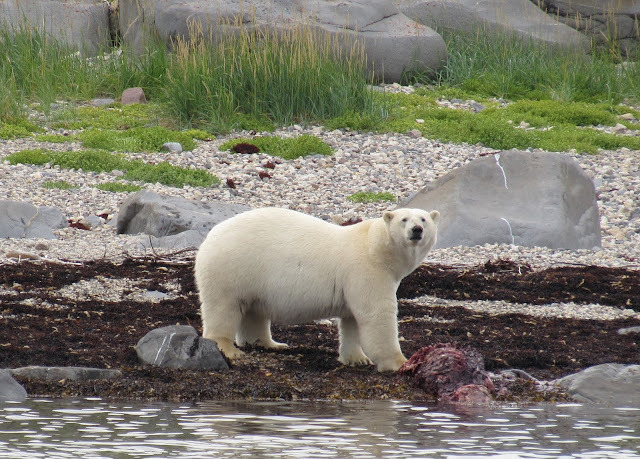 Inuit hunters had shot it and then stripped off the nourishing layer of muktuk (the top layer of skin and inch or two of blubber) before leaving the rest for the bears. 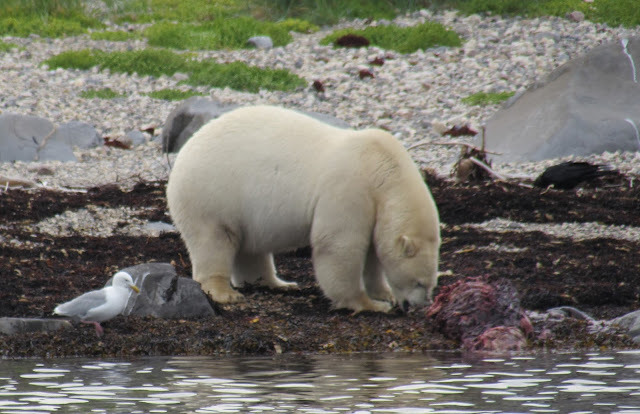 With little to eat until the freeze up, when they can once again go hunting for seals on the ice, the polar bears are always happy to discover any food in the off season. When the biggest male had finished he even lumbered into the ocean to cool off and check us out. 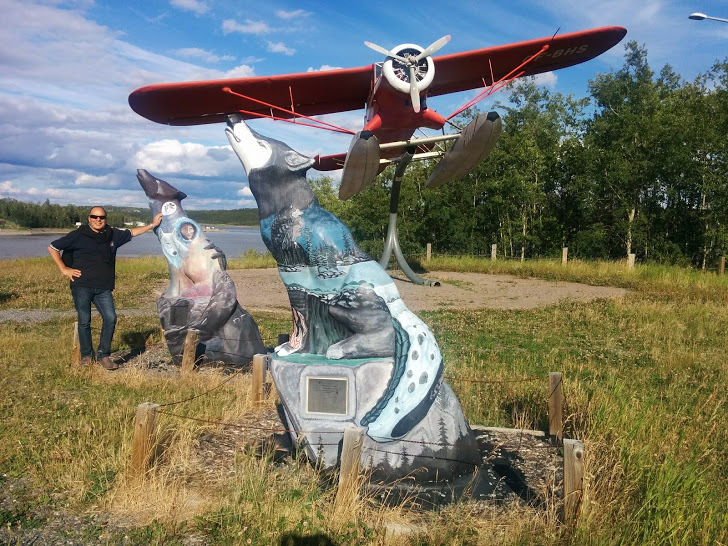 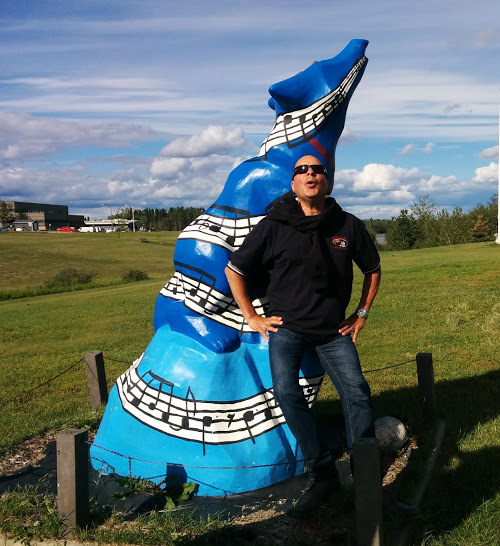 It was a tough act to follow but a perfect way to cap off a lovely visit to Churchill, a colourful, quirky place where the locals have really had to band together to ride the economic roller coaster. 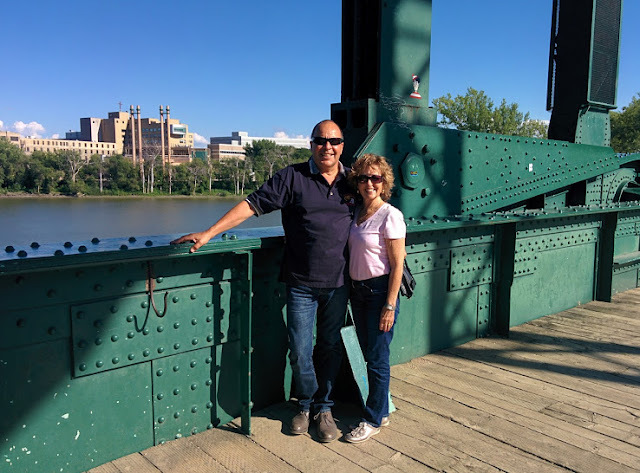 In spite of all the frustration with corporations and governments the folks manage to stay super friendly, put on a happy face, and focus on delivering a fantastic experience. The weather station with its missing stone (the key to the whole design) sums up perfectly their sense of humour. 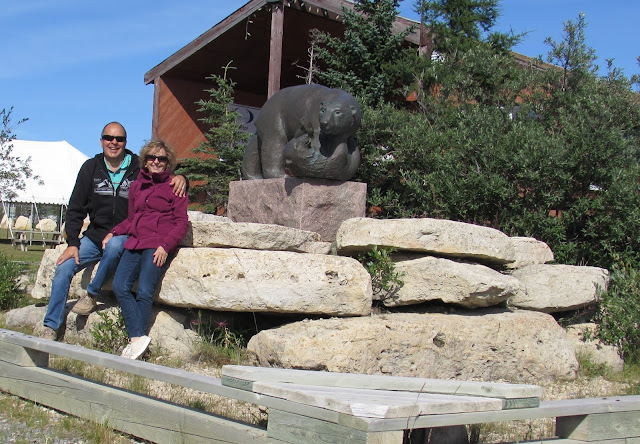 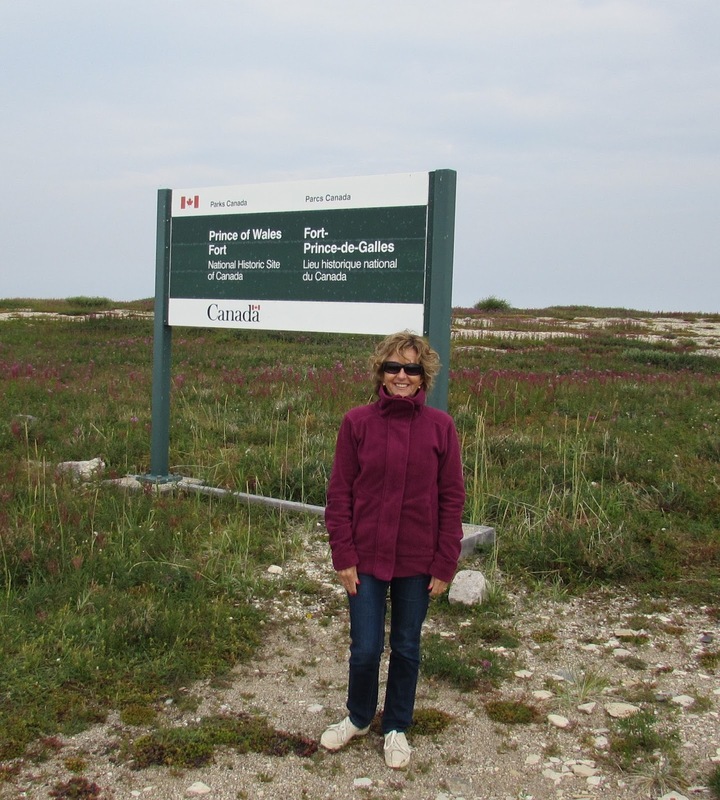 Crossed the 60th parallel for the 2nd time this summer with a short stop in Rankin Inlet on the way back to Winnipeg that allowed us to claim a visit to Nunavut, Canada's newest territory. 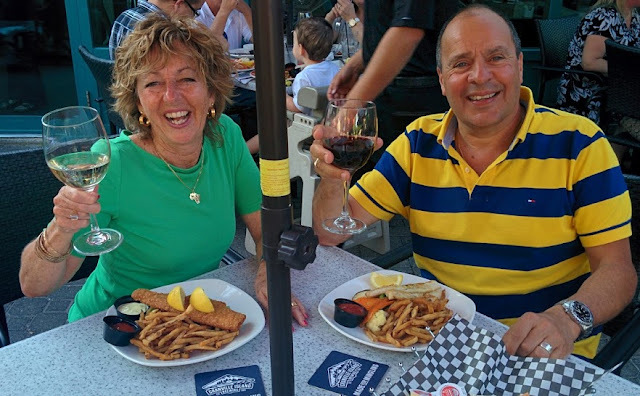 Life was in full swing back at the Forks and the restaurants had stocked up on their delicious pickerel. 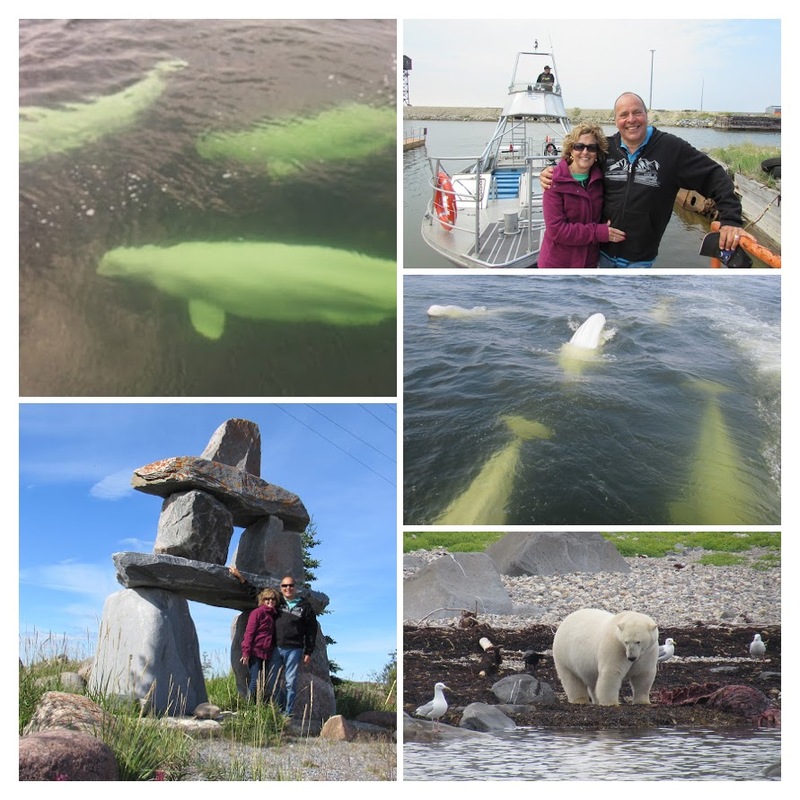 The safari was over and we had lucked out with seeing both the polar bears and beluga whales, a perfect excuse to celebrate. 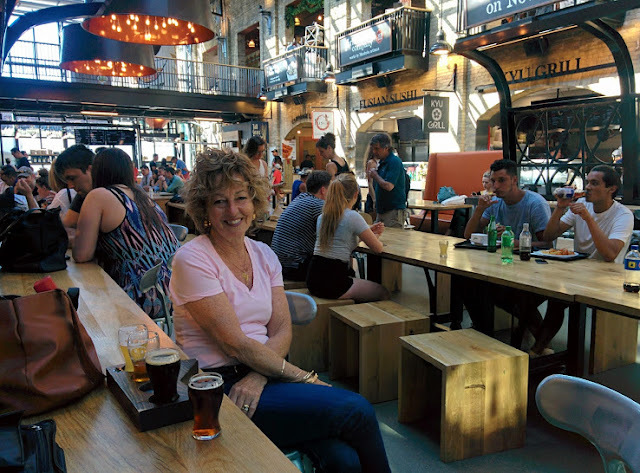 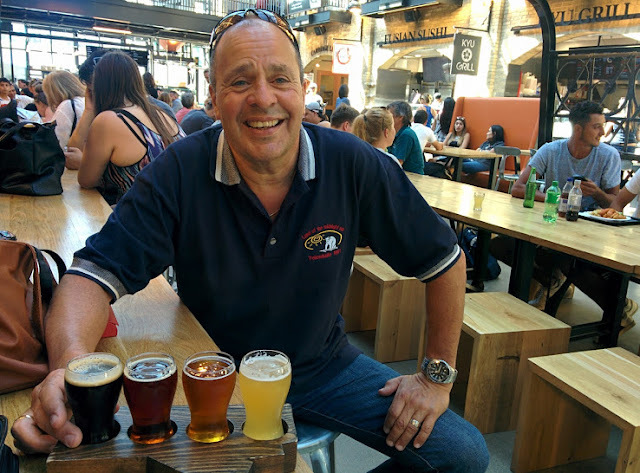 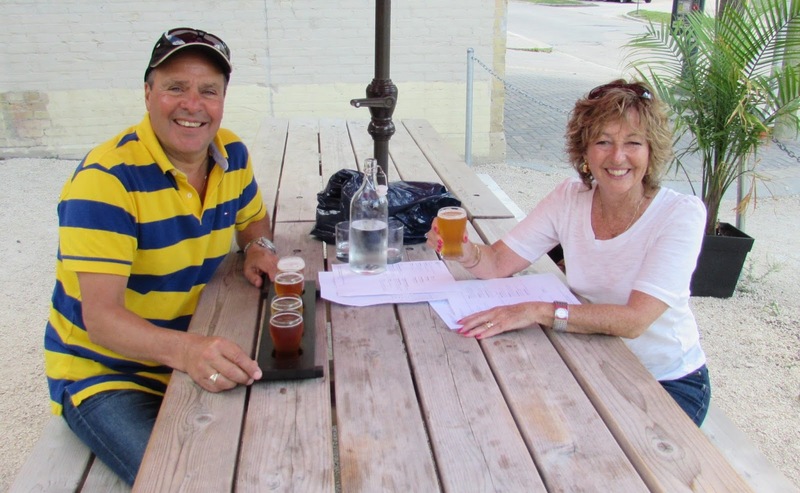 Finished up the following day with a walk about town admiring the tree lined streets and renovations under way in the Exchange District where we re-discovered the Peg microbrewery with its great food and beer. 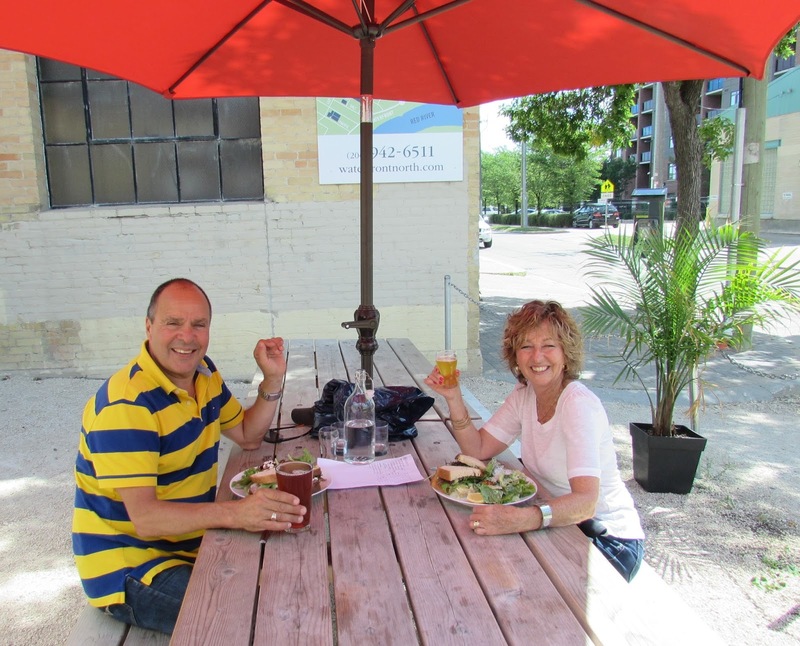 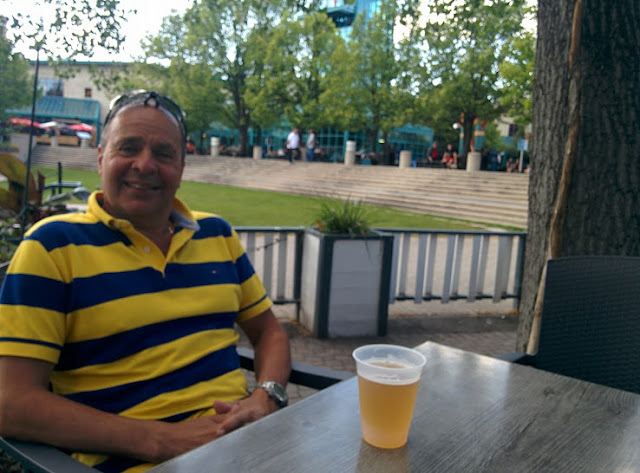 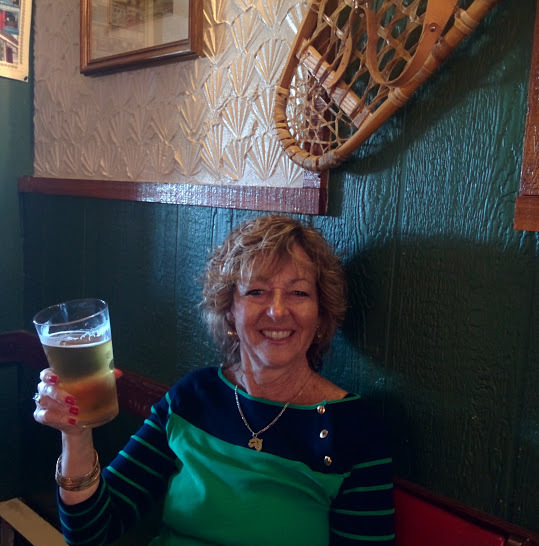 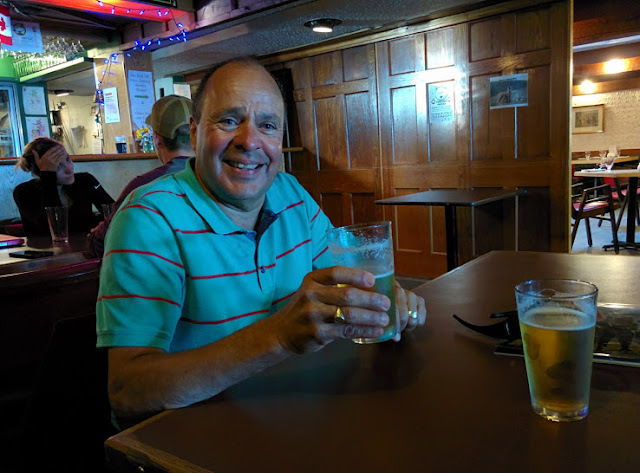 In sunny Manitoba the only way to beat the heat is under an umbrella with a fresh pint and, after an incredible safari, it was a perfect ending to another great trip.